August | 2014 | Hand Luggage. 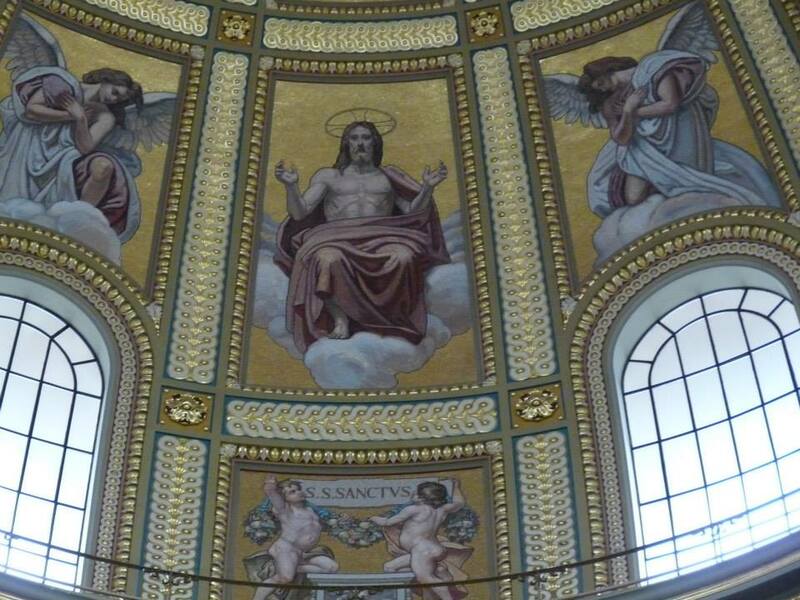 Another little oddity in Budapest is the Cave Church. It does exactly what it says on the tin. 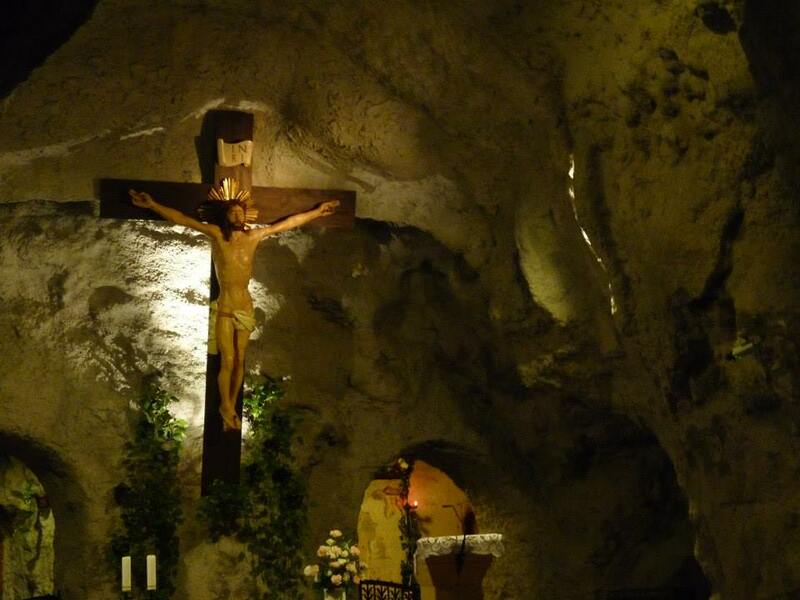 It is a church, in a cave. Saint Ivan’s Cave (Szent Iván-barlang) is named after a hermit who lived there and healed people. 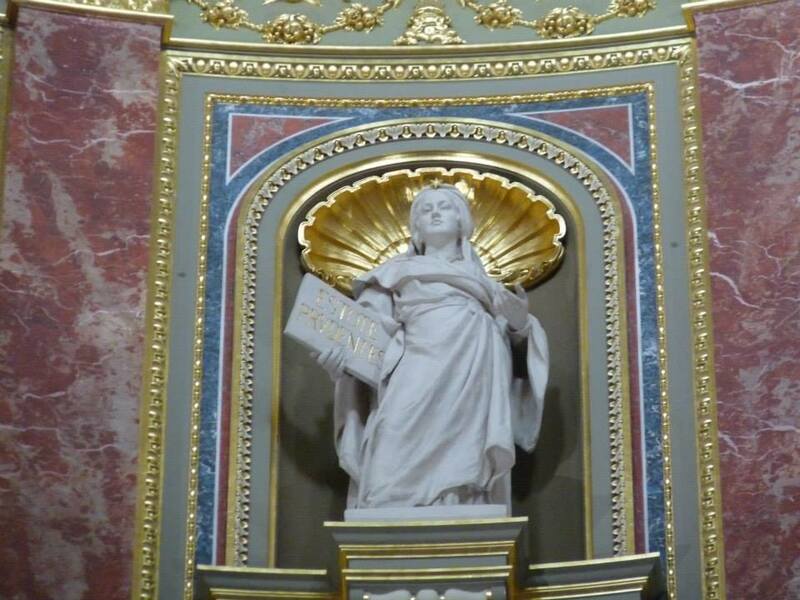 The church was founded in 1926, by a group of Pauline monks after a pilgrimage to Lourdes, France. Originally, the altar was located at the entrance of the cave and the congregation sat outdoors on the terrace. 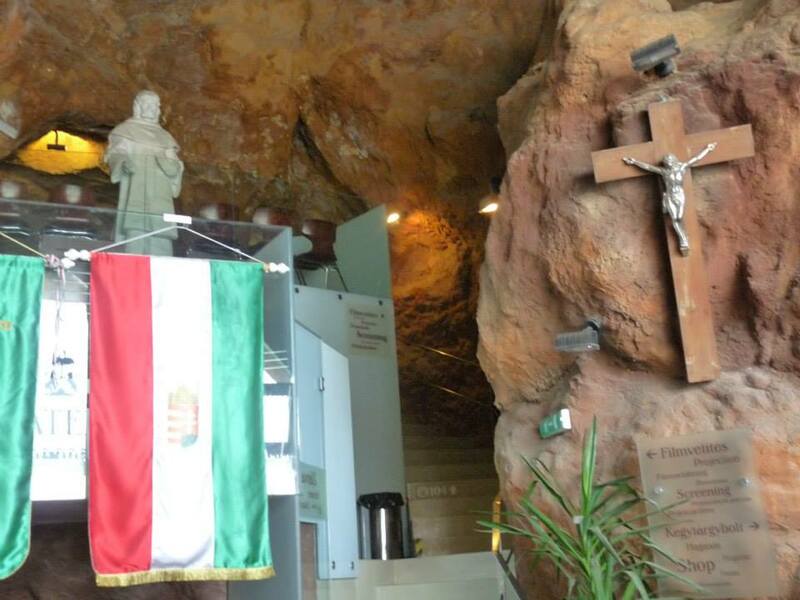 This is why Cave Church is known as Sziklatemplom (‘Rock Church’ or ‘Church by the Rock’) in Hungarian. Expansion of the cave and structural reinforcement followed throughout the 1930s. During World War II, the church served as a hospital and asylum. After WWII, the monks were arrested and their superior, father Ferenc Vezér, was sentenced to death by the new Communist regime. In 1951, the church entrance was completely sealed with a thick concrete wall. A part of the wall can still be seen by the entrance. The church finally reopened in 1991, was restored and given back to the Pauline monks and it continues to serve as a church to this day. 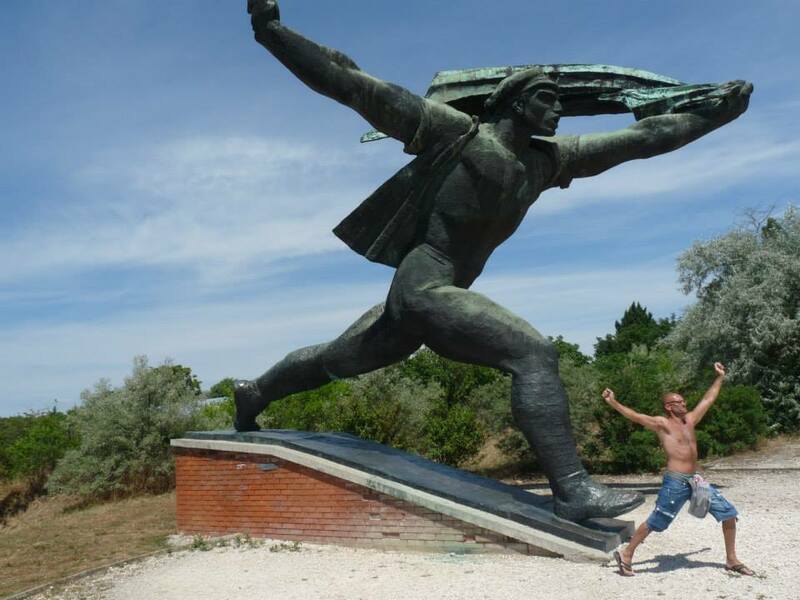 The shadow of the Soviet Era falls long over Budapest and nowhere shows the actual physical dominance of the USSR better than Memento Park. 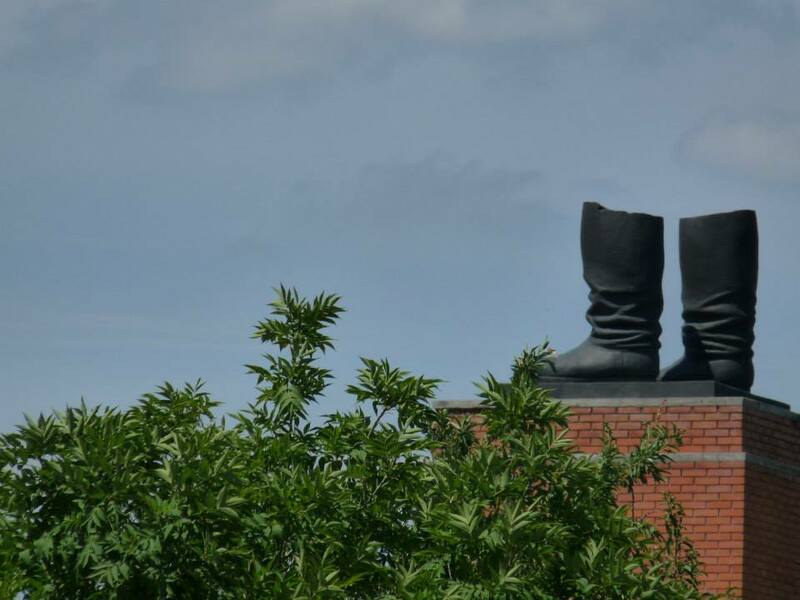 These omnipresent works of art served as daily reminders of the “liberation” of the city from the Nazis, but also, an ever present sign of a new oppression. 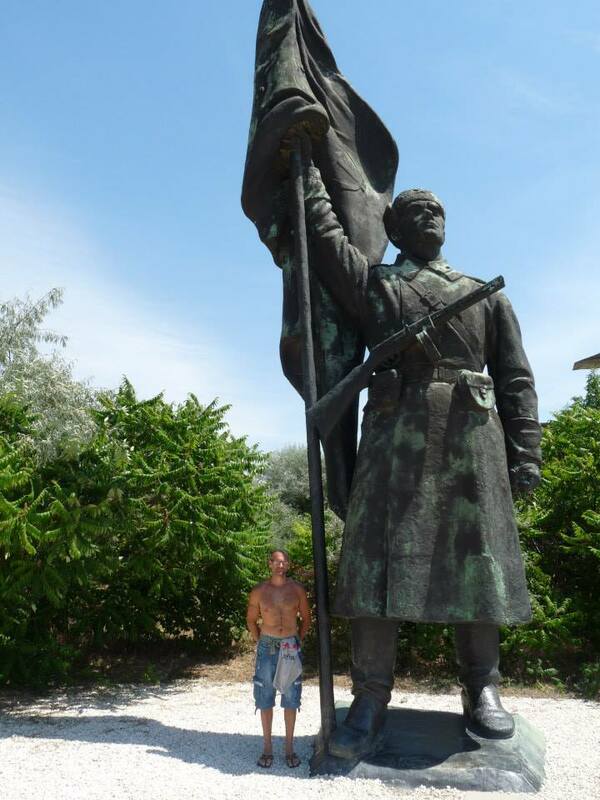 Here we size ourselves up against one of the monstrous statues, striking a typically energetic pose. 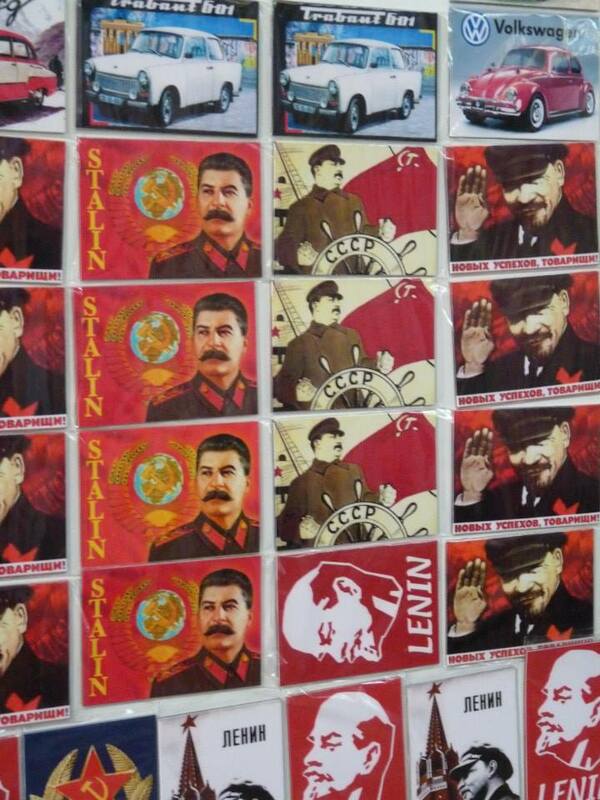 The seeds of the downfall of the Soviet regime started with The Hungarian Revolution of 1956. This was a spontaneous nationwide revolt against the government of the Hungarian People’s Republic and and its Soviet-imposed policies. 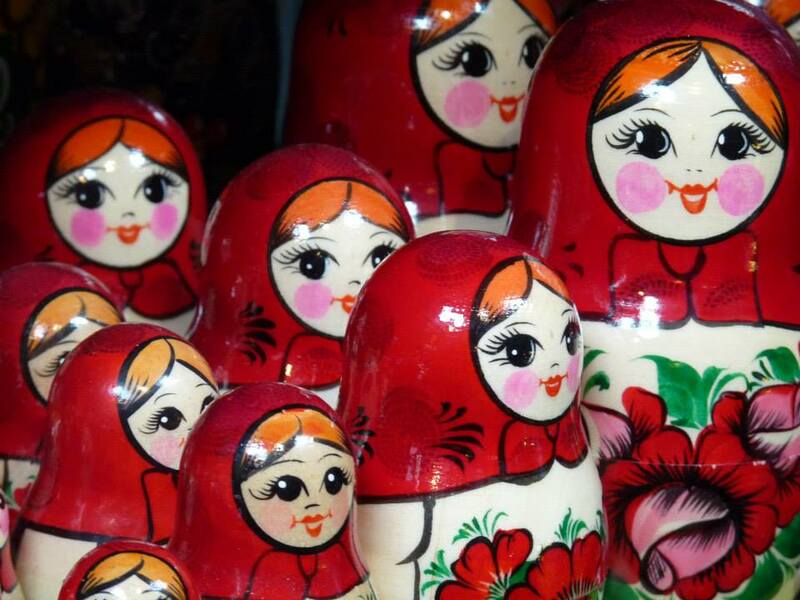 It was the first major threat to Soviet control since the USSR’s forces drove out the Nazis at the end of World War II and occupied Eastern Europe. 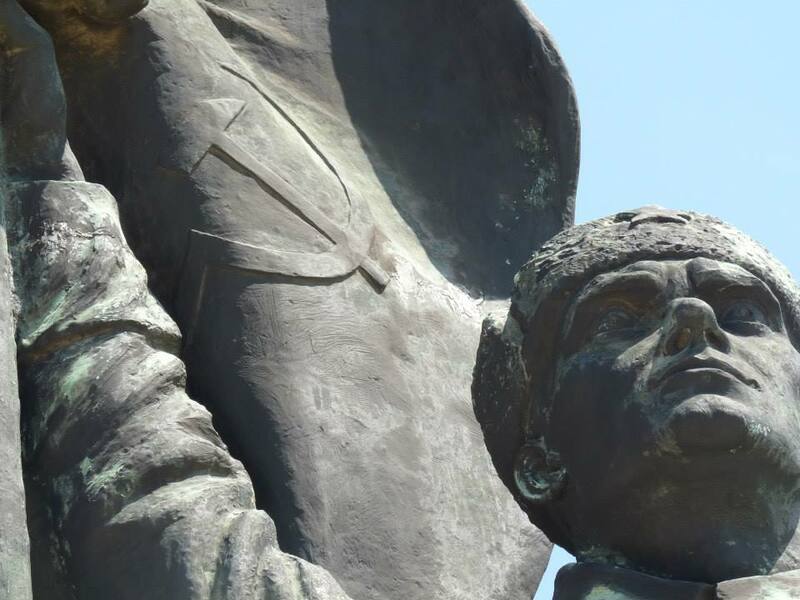 During the revolt demonstrators decided to carry out one of their demands – the removal of Stalin’s 30-foot-high bronze statue that was built in 1951 on the site of a church, demolished to make room for the monstrosity. 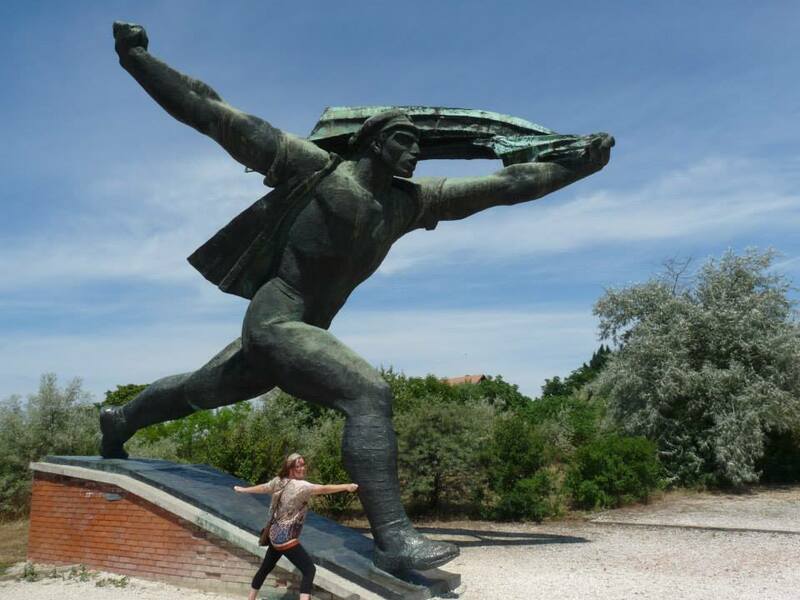 The statue was toppled and jubilant crowds celebrated by placing Hungarian flags in Stalin’s gigantic boots, which were all that was left of the monumental statue. 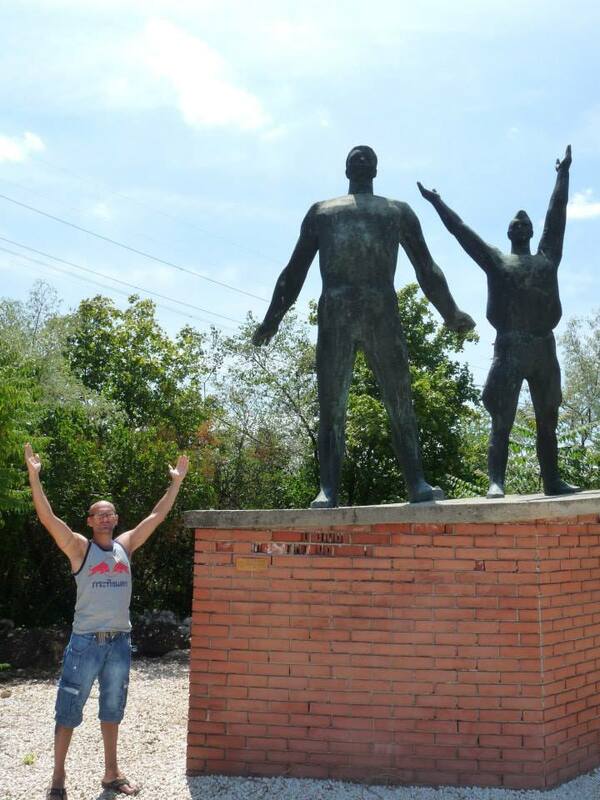 The remains can be seen at Memento Park (see photo above). Despite the failure of the uprising, it was highly influential, and came to play a role in the downfall of the Soviet Union decades later. 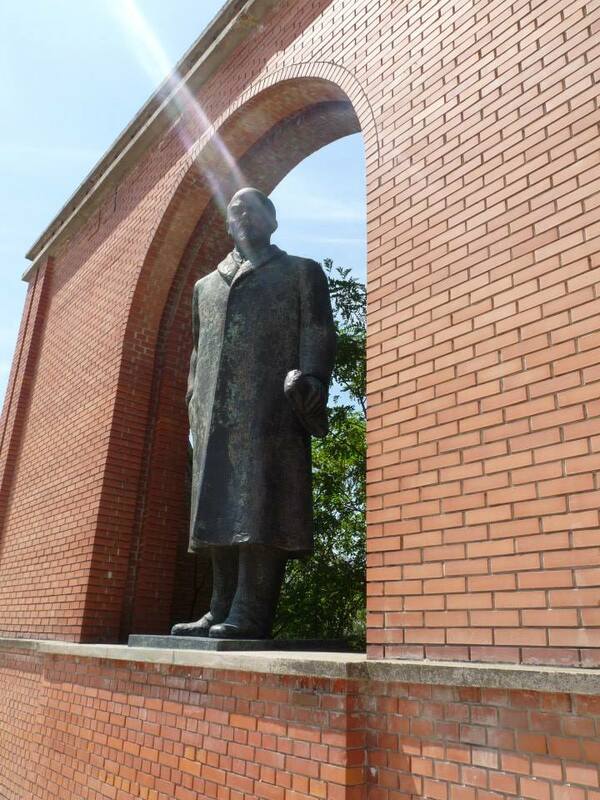 The park also features other curios such as the Communist hotline – fancy a chat with Lenin, Stalin or any of the other commie headliners? There’s a chance to check out one of the Eastern Bloc’s hottest exports – the Trabant, plus awful, yet slightly comedic, black and white film reels of the secret police’s training in Communist Hungary. 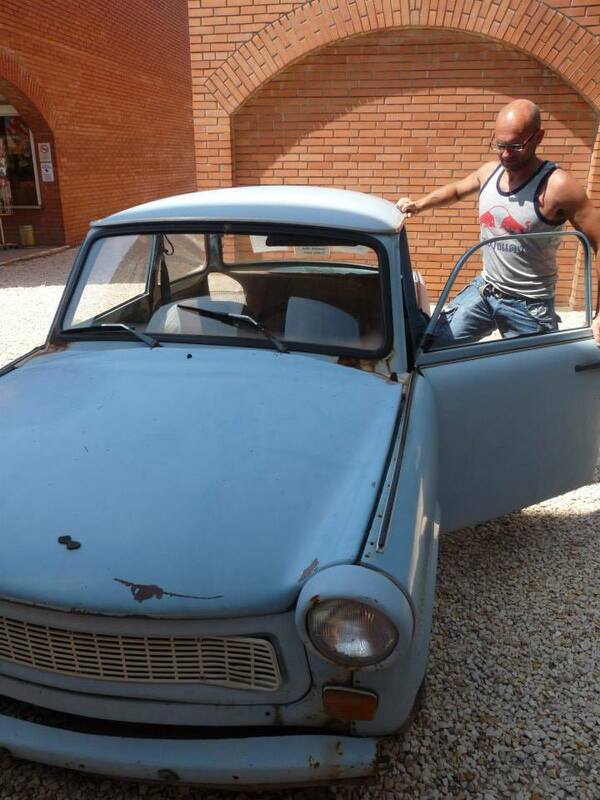 Here’s the trusty Trabant. 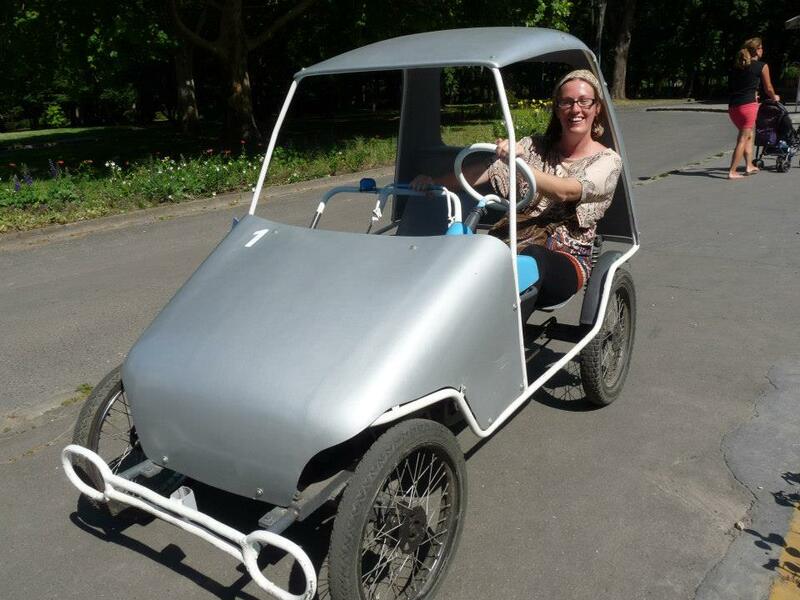 This odd little car was the most common vehicle in East Germany, and was also exported to countries both inside and outside the eastern bloc. 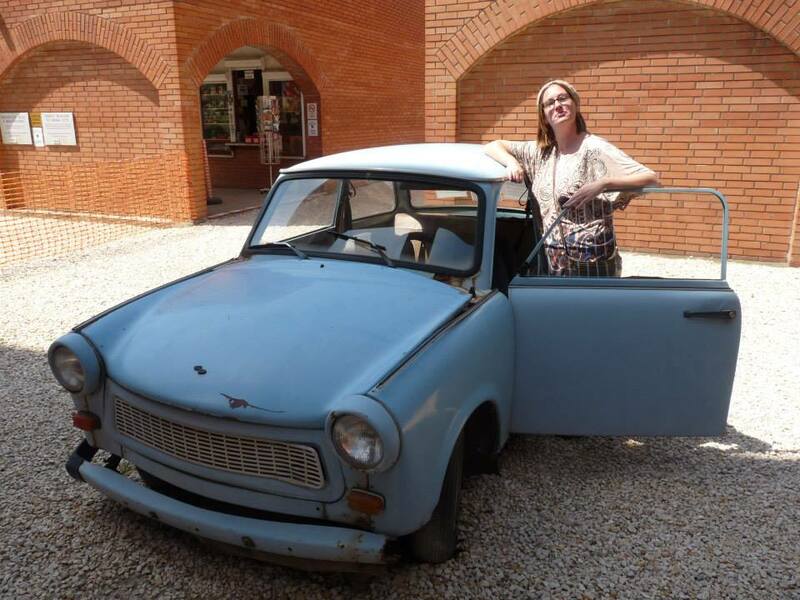 Despite its poor performance, inefficient two-stroke engine and production shortages, the Trabant is still regarded with tongue in cheek affection. 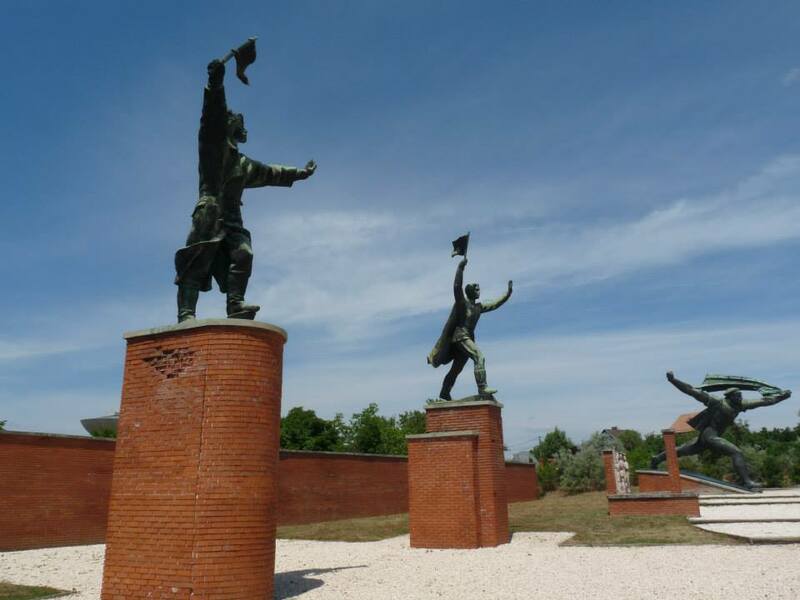 More rousing statuary portray the might of the red army, the heroic workers and the ‘liberation’ by the Soviet regime. 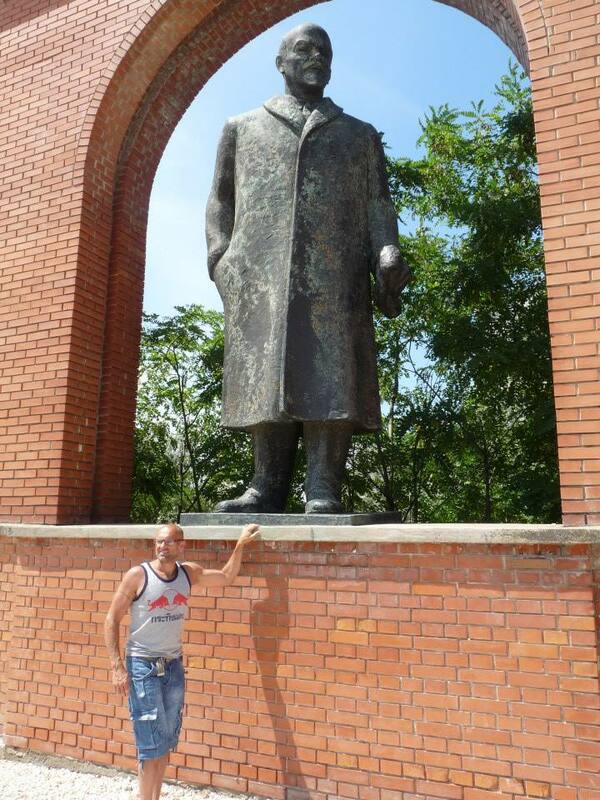 Architect Ákos Eleőd, designer of Memento Park says of the place: “This Park is about dictatorship. 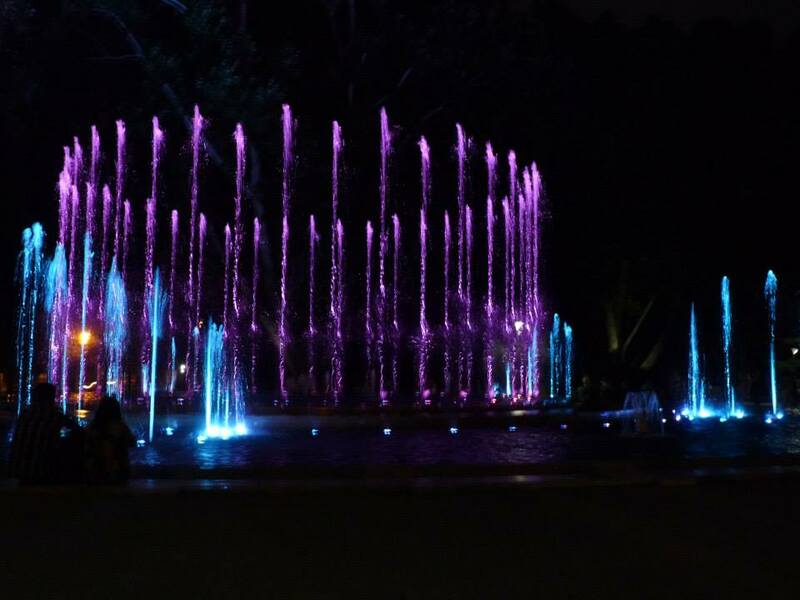 And at the same time, because it can be talked about, described and built up, this Park is about democracy. The other half was constantly intrigued by the island in the middle of the Danube. This green, leafy oasis is Margaret Island and it allows a peaceful break from the city. 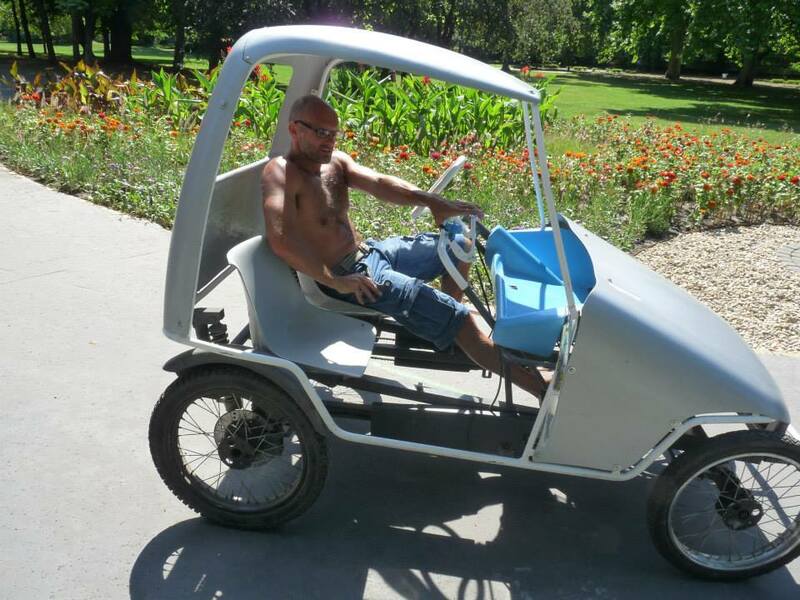 The island has a range of activities on offer from sedate walks, to a zoo, water park, pubs and clubs. 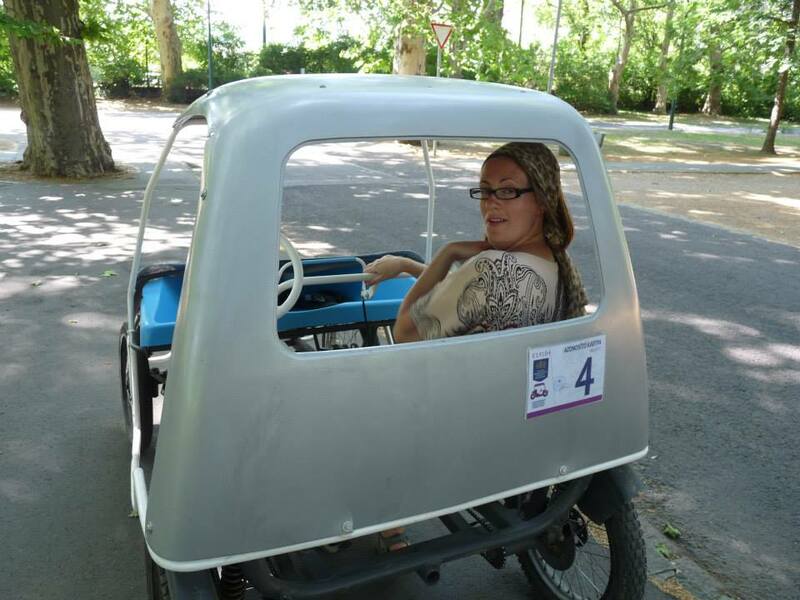 So, like an over sized pair of loons, we were crammed into a tiny, battered child’s toy for a breakneck carouse around the island. 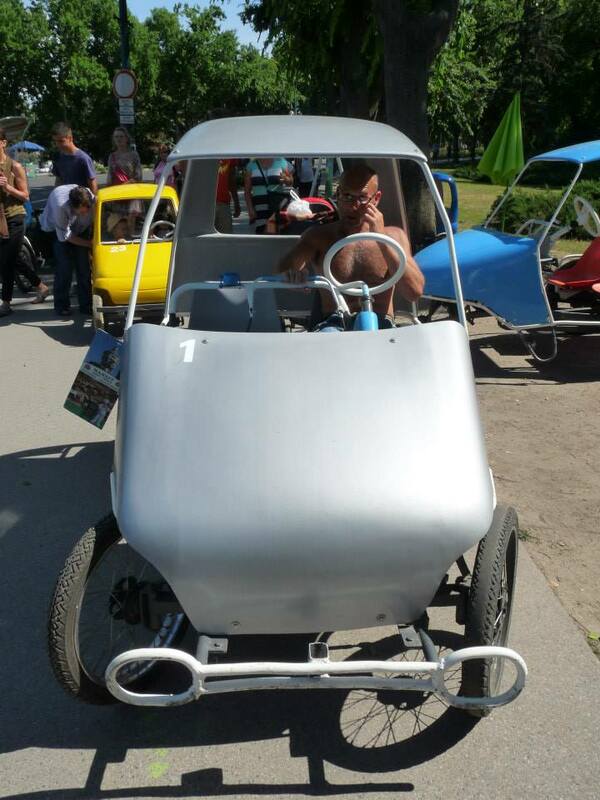 There are a variety of rules involved in “driving” a pedal car. Stay on the marked routes, do not off-road, do not terrorise pedestrians. Neil proceeded to ignore them all. Attempting to side slide the dinky motor, at one point almost getting us onto a main road (pooed myself at that point) haring across flower beds and generally being a menace. Contrary to appearances I am not actually drunk in charge of a child’s toy! 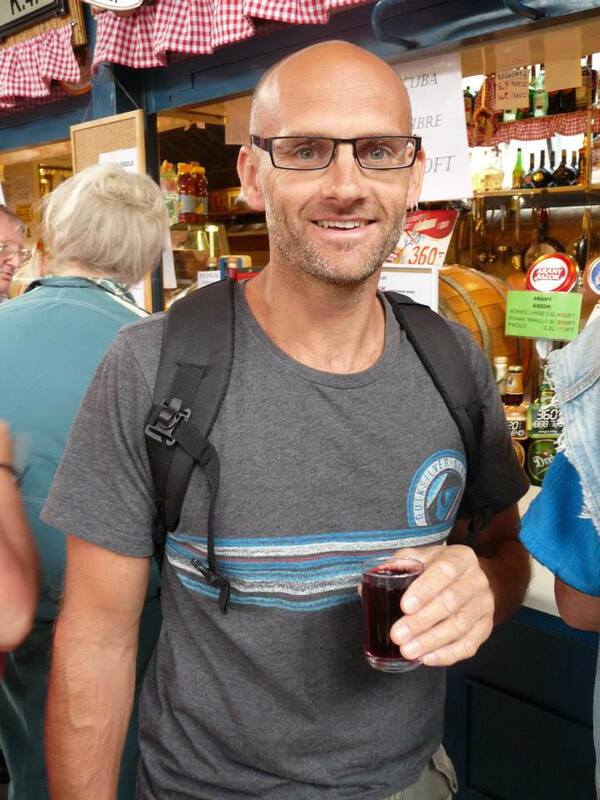 Although having whacked my shins on the dash board once too often I think I wished I had been . .
After our terrifying jaunt around the island we went for a much needed beer and pizza and watched the legion of joggers who use the island as a circuit lap. In the middle Ages it was called the Island of Rabbits (Nyulak szigete) and was a royal hunting reserve. In the 13th century King Béla IV. founded a nunnery on the island and made a vow to sent his daughter, Princess Margaret there if he could rebuild the country devastated by the Mongols. 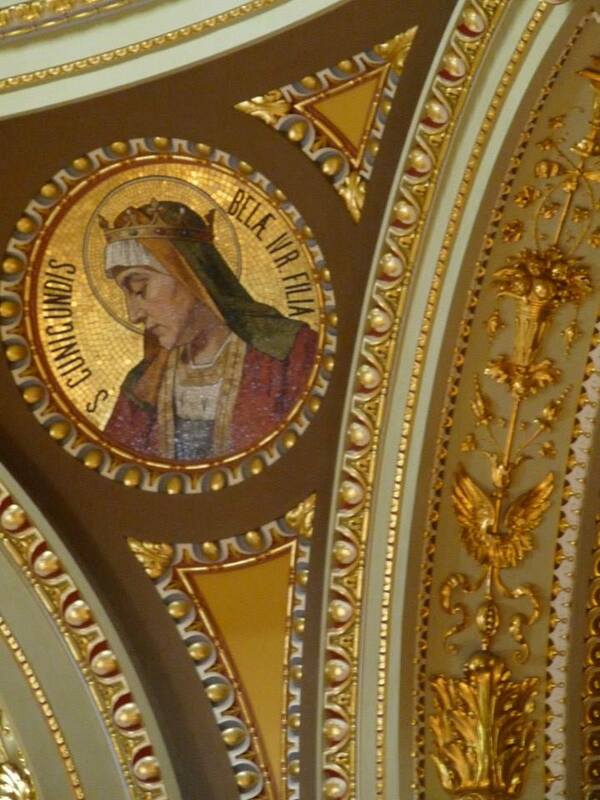 After the invading Mongols returned home, faithful to his vow Béla sent the 11-year old Margaret to the convent. Since then the island has been know by her name. Until 1901 the island could only be approached by boat or ship but the part of the Margaret Bridge that now leads onto the island was built in 1901. 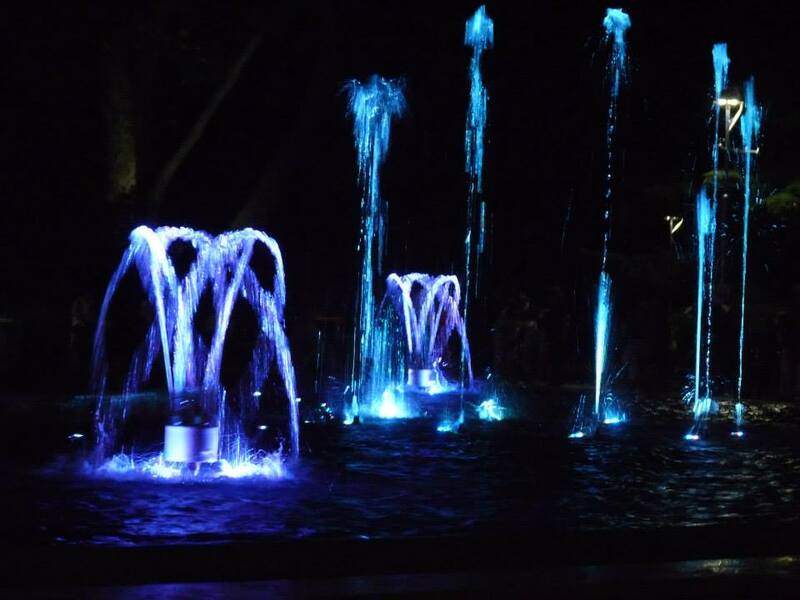 But enough of that, there’s fountains! 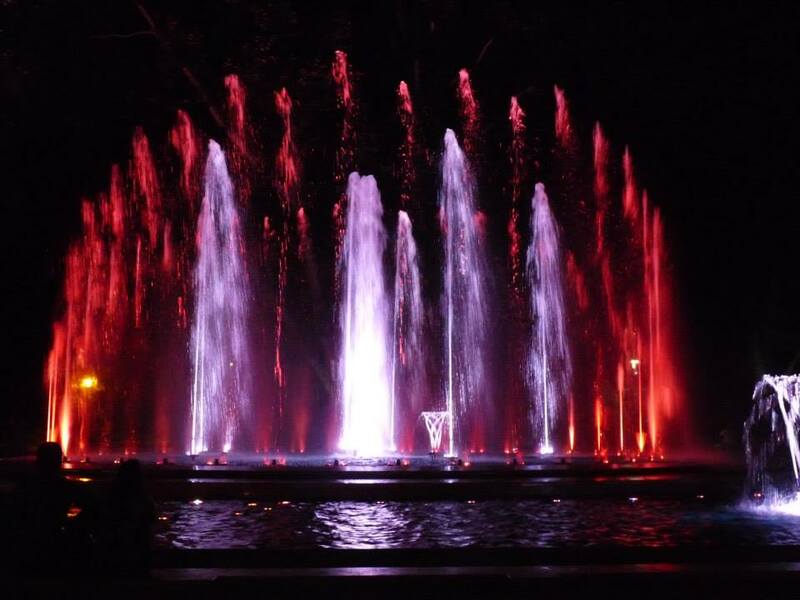 Musical fountains! 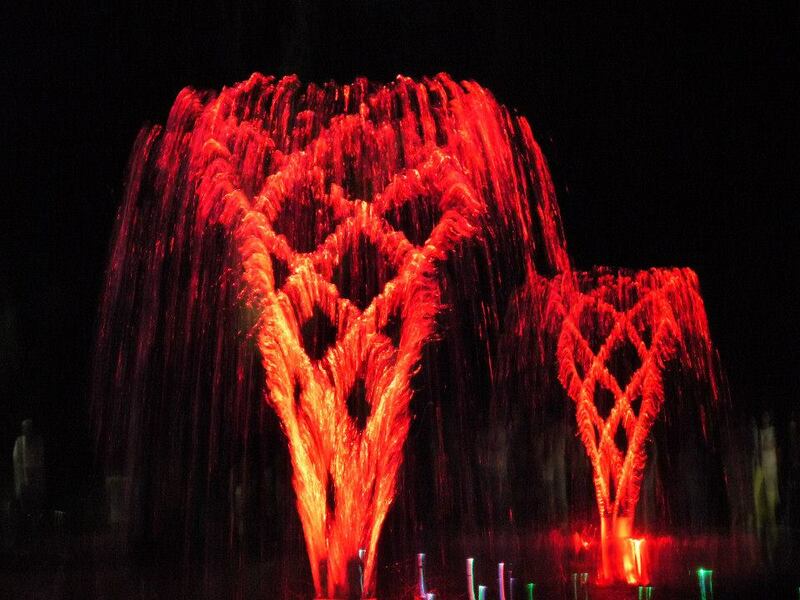 With coloured lights! JOY! 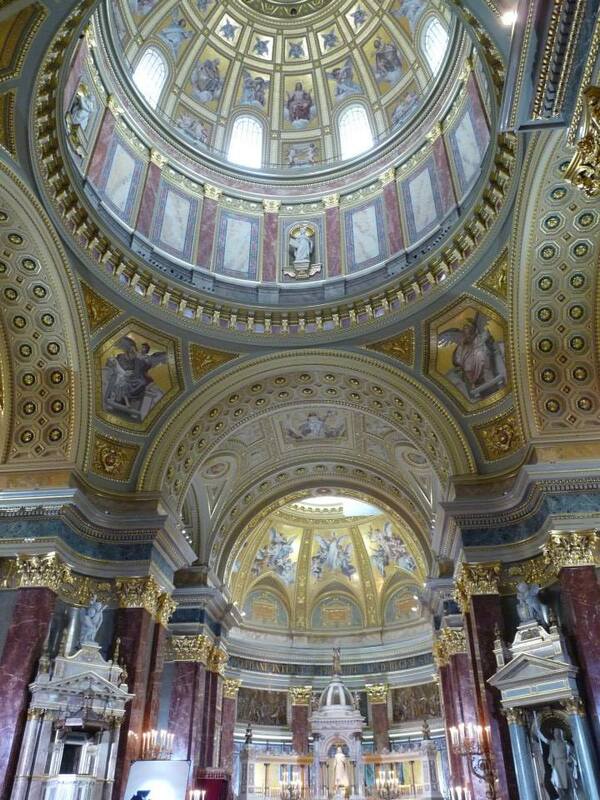 Another stop on the Budapest whirl wind tour is St Stephen’s Basilica. 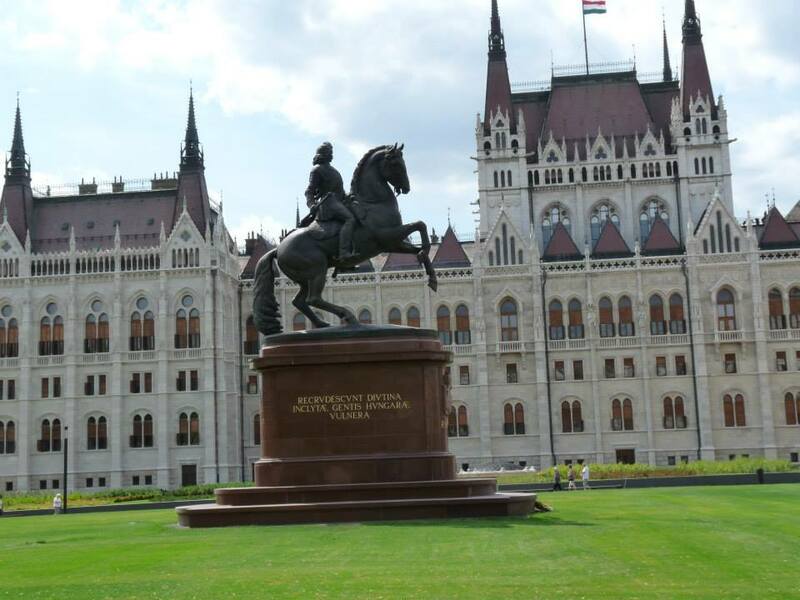 One of the top ten most photographed buildings in the world it’s named in honour of Stephen, the first King of Hungary. Apparently his mummified right hand is rather gruesomely still housed in the Basilica’s relic shrine. Built in a Neo-Classical style the exterior is dominated by two large bell towers. In the southern tower is Hungary’s biggest bell, weighing over nine tonnes. 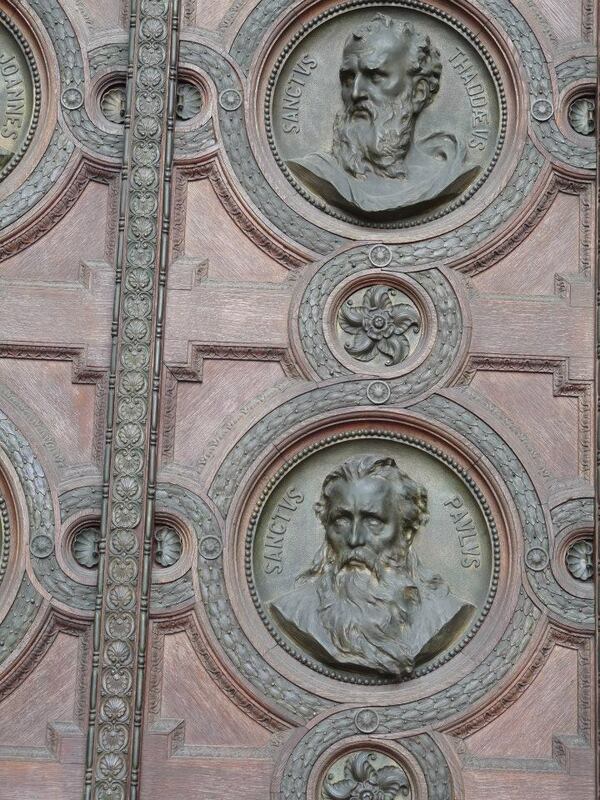 Here’s the ornately carved door to the Basilica and some of the spectacular features inside the cavernous building. 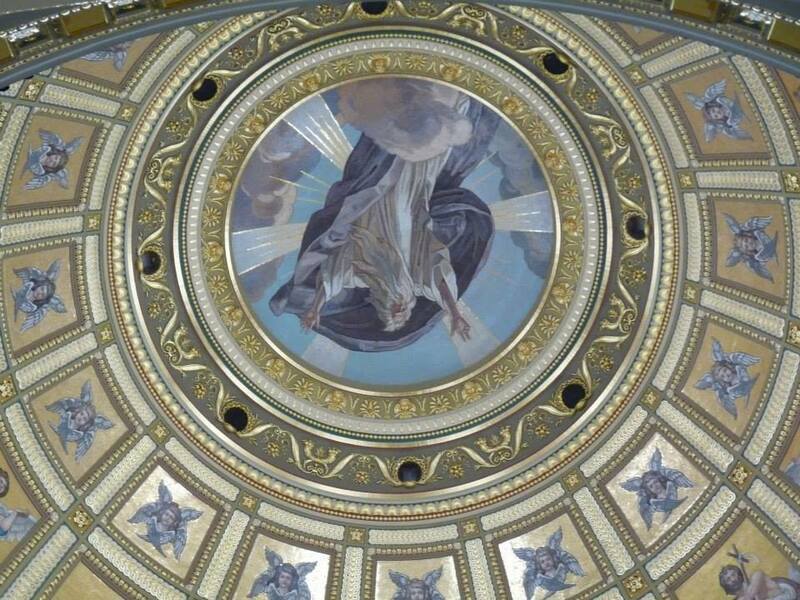 Here’s looking up into the ornate Cupola in the centre of the Basilica. 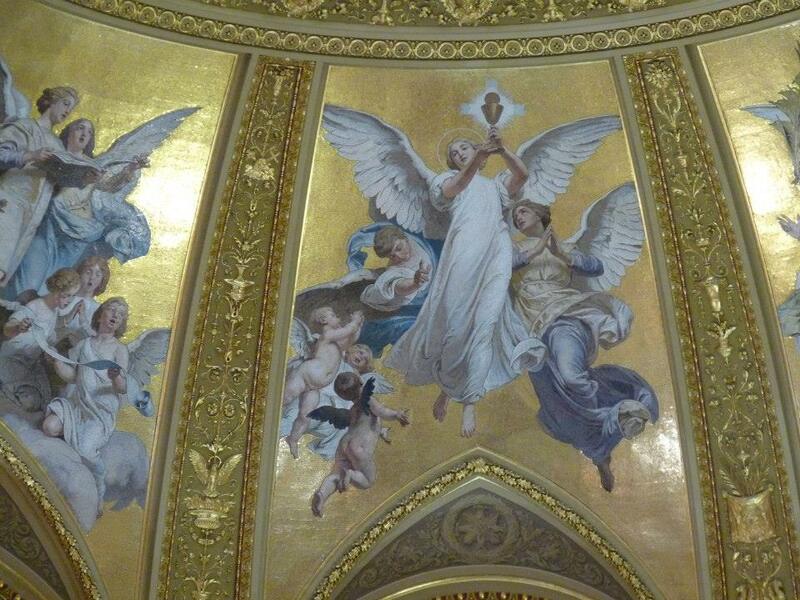 Resplendent with Biblical imagery, culminating with a fresco of God the Father. 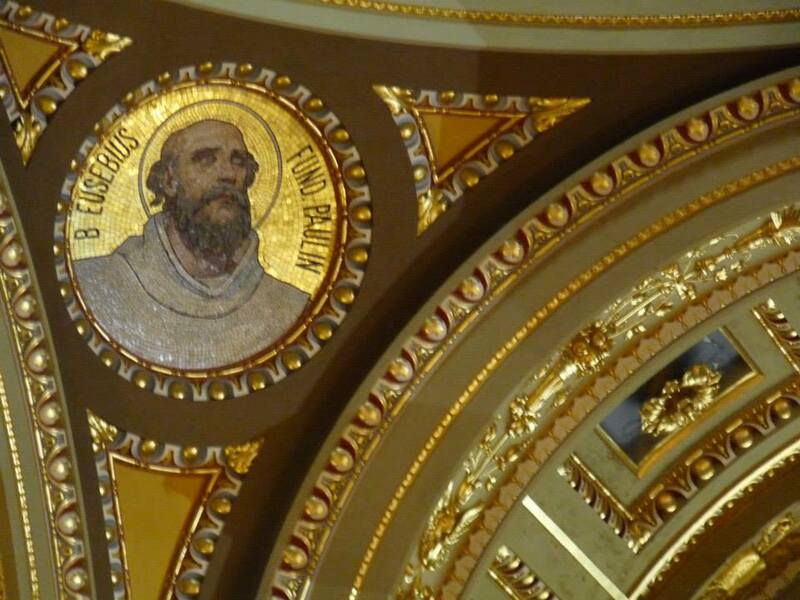 It took more than five decades and three architects to build the impressive Basilica. Several unfortunate events delayed the works. 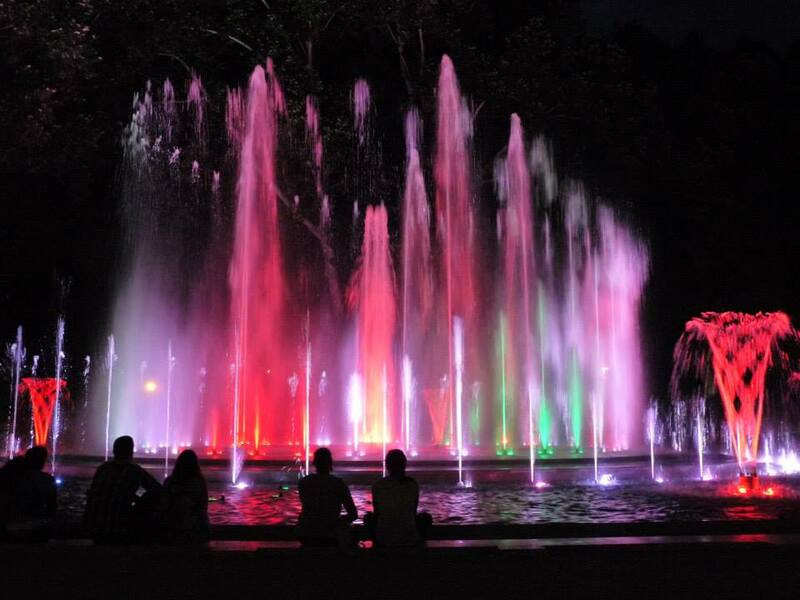 József Hild made the designs in 1845 but construction was delayed due to the 1848/49 Revolution and War of Independence, works finally started in 1851. After the death of Hild, Miklós Ybl, took over overseeing the construction. In 1868 the dome collapsed, (luckily nobody died). Ybl drew up new plans and building started again almost from scratch. He couldn’t see his work completed, as he died in 1891. József Krauser finished St Stephen’s Basilica in 1906. 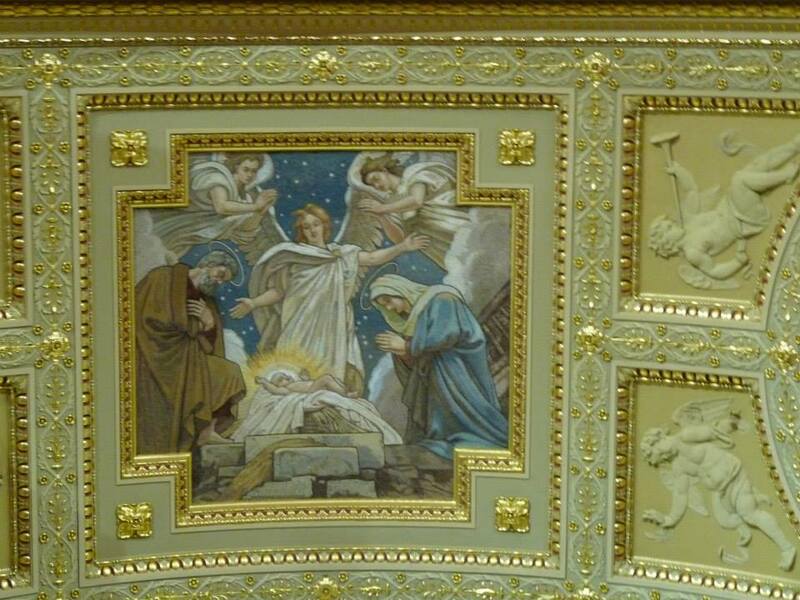 Apparently, at the consecration mass Emperor Francis Joseph kept sneaking a peek upwards afraid of another collapse of the dome. I am sure you’ll agree that it was worth all the effort though! 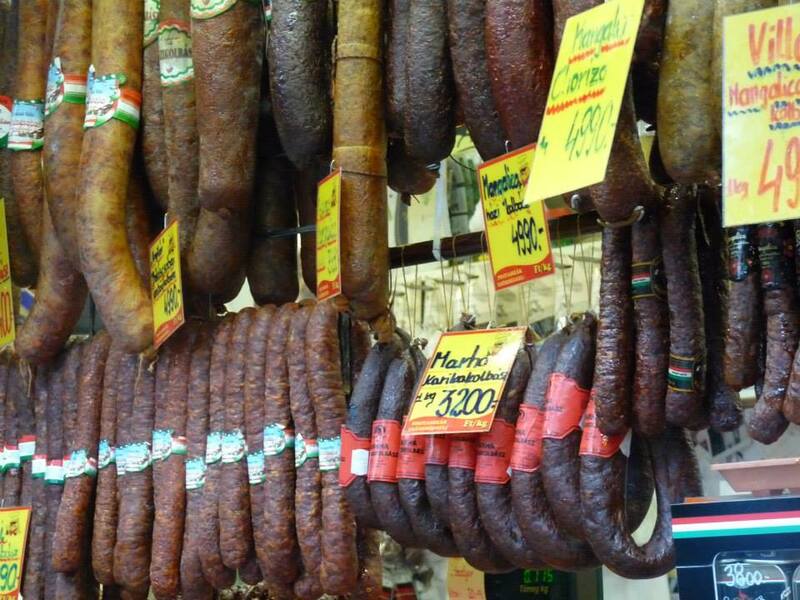 You know it has to happen, sooner or later I would find where they had stashed the pinnacle of my holiday joy – the FOOD MARKET!! 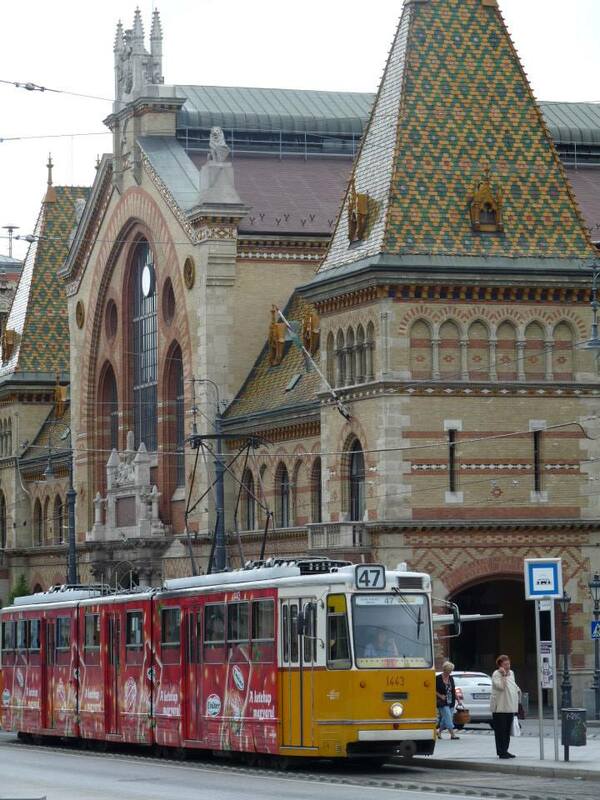 In Budapest’s case this is the Central Market Hall (Nagy Vasarcsarnok) close to the green Liberty Bridge. 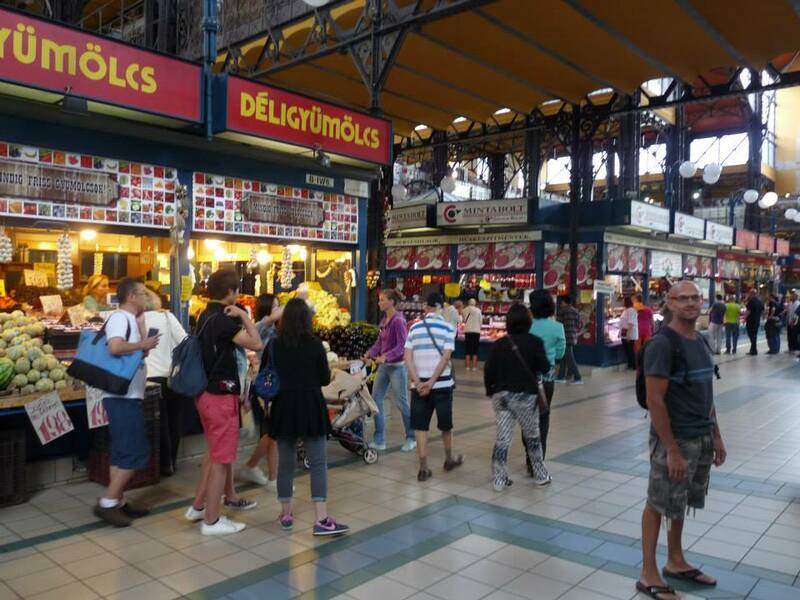 This colourful, bustling cornucopia of consumerism offers a huge variety of stalls on three floors and features a gorgeous colourful roof of Zsolnay tiles. 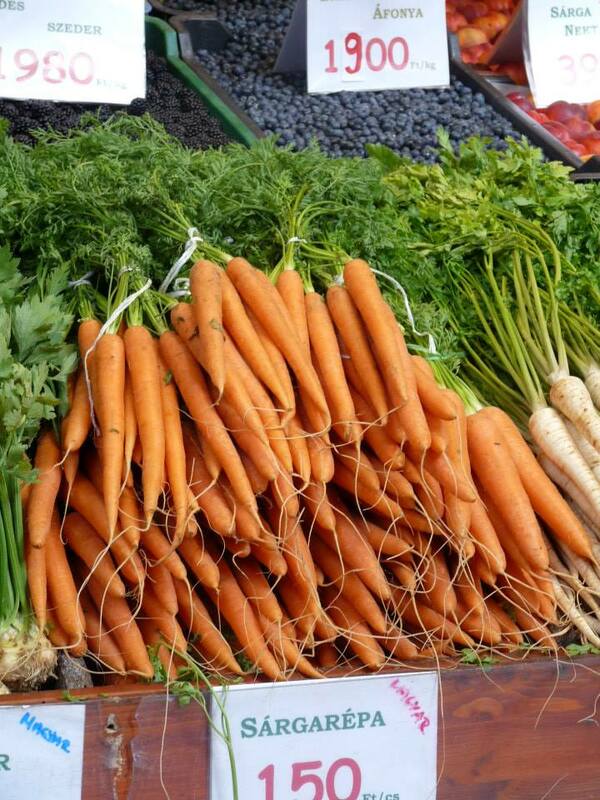 Here it is with one of the super cute little trams zooming past plus just a sample of the tasty produce on offer. 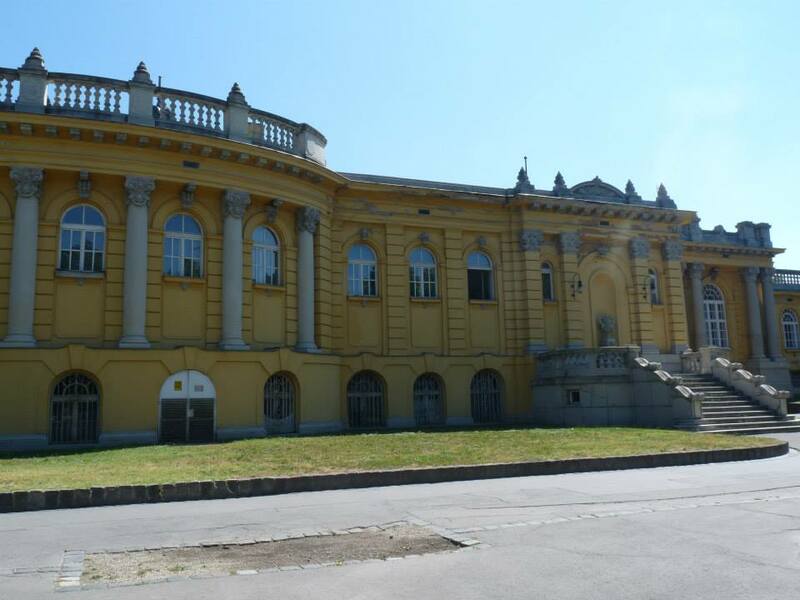 The building was designed and built by Samu Pecz around 1897 but during the World Wars it was damaged and then closed for some years. 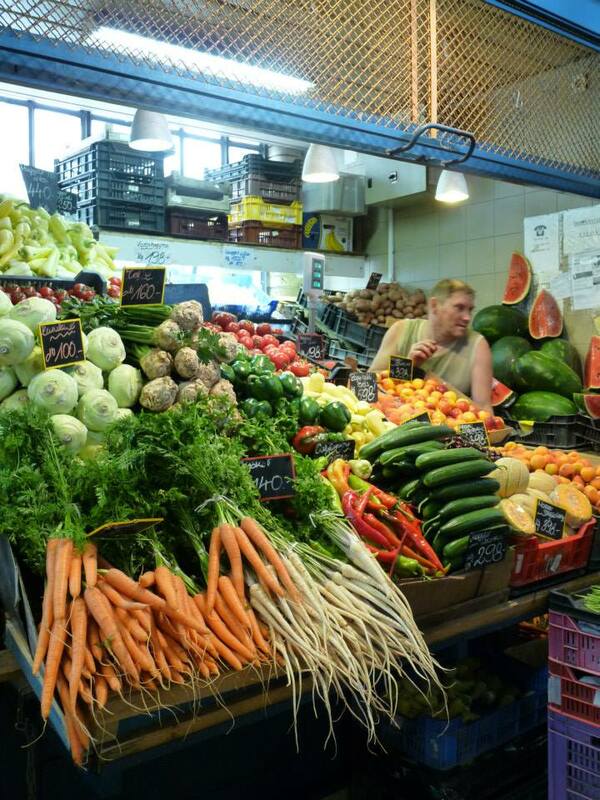 However during the 1990s restoration work brought the market back to its ancient splendour. 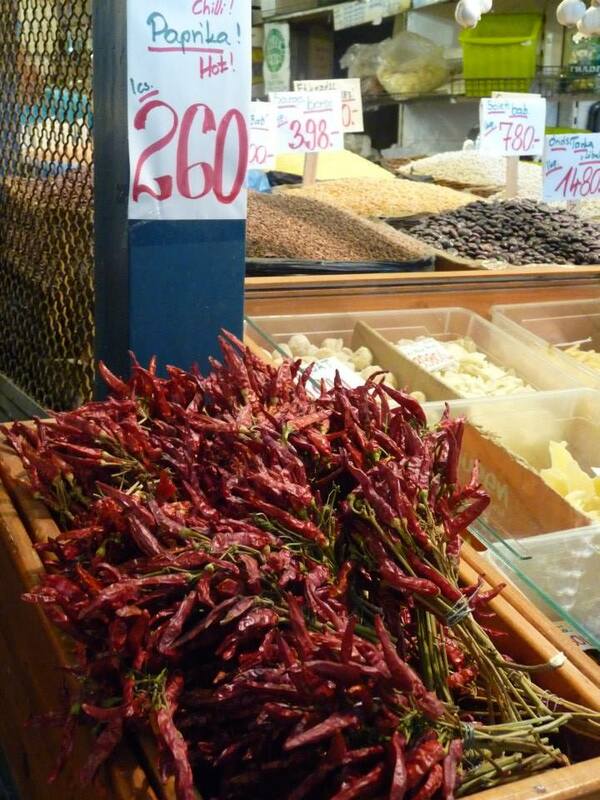 Stalls on the ground floor offer produce, meats, pastries, candies, spices, and spirits. 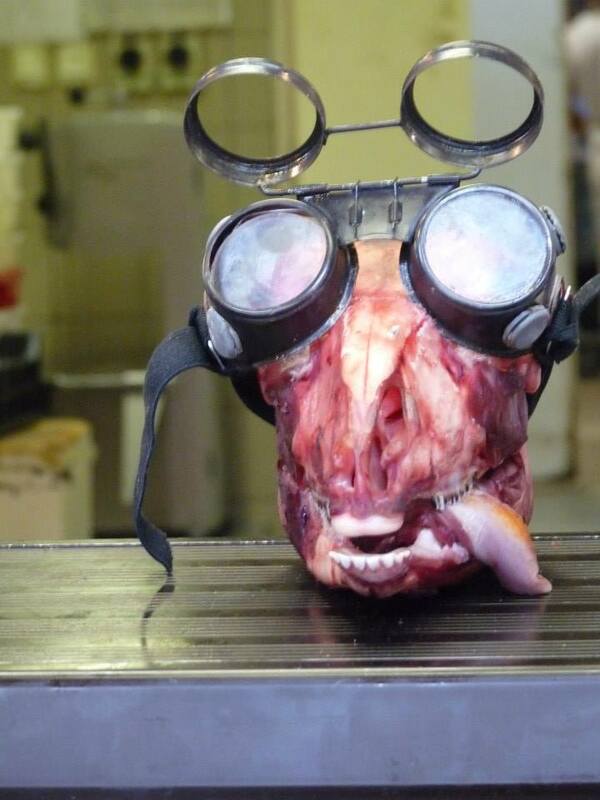 Here’s a disturbing goat with goggles, an even creepier traditional doll and an obligatory veg pic! 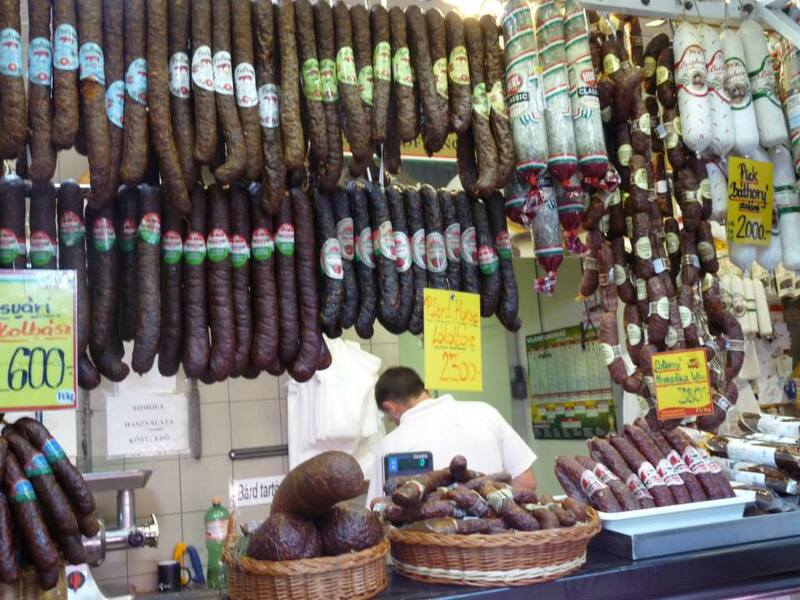 Then it’s off to the carnivore’s paradise section of the market, pig, cow, sheep, unidentified animals . . . you are all consumable . 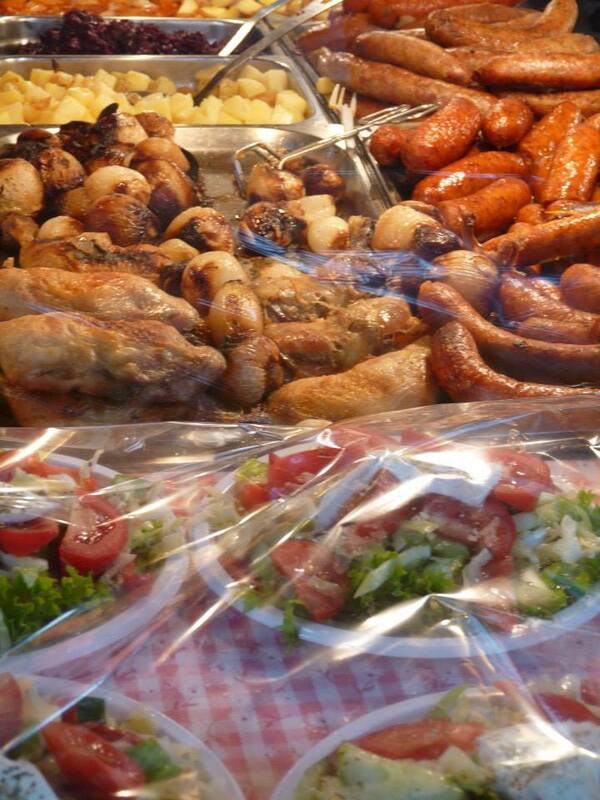 . .
Amusingly placed sausages distract me from the overwhelming meatiness of this section of the market!! The second floor has mainly hot, bustling eateries and souvenirs. 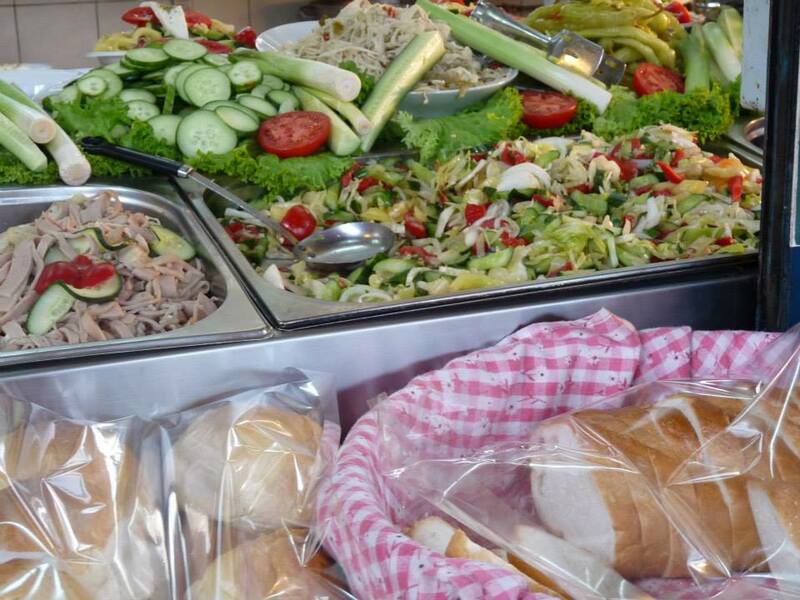 From goulash to rice balls, colourful salads to spicy chicken, the food is warm, simple and comes in huge portions! 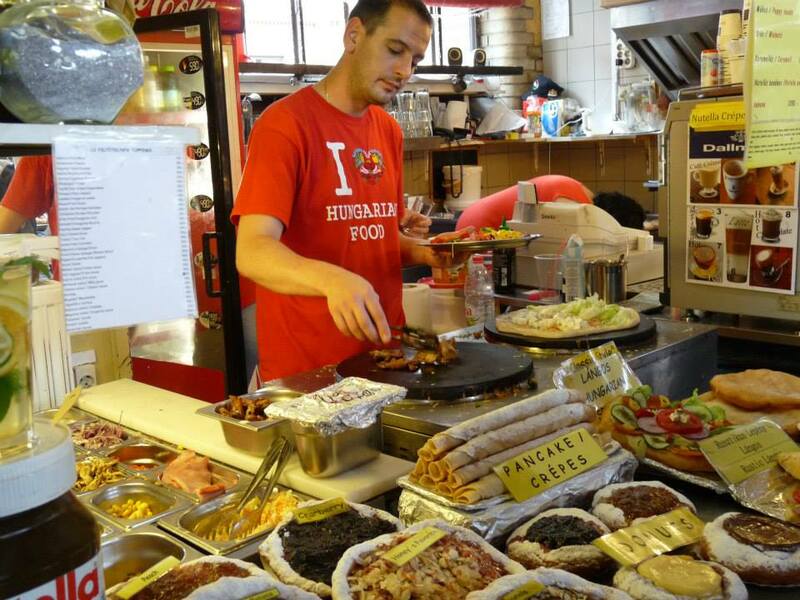 Neil checks out some hearty Hungarian fare and samples some of the local tipple! 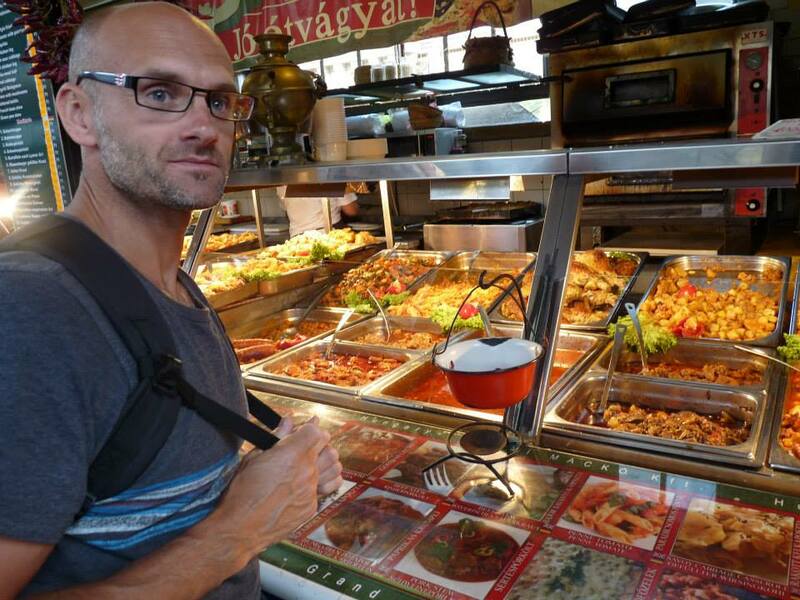 This includes a marvellous lángos stand serving the deep-fried snack either as a savoury or sweet version. 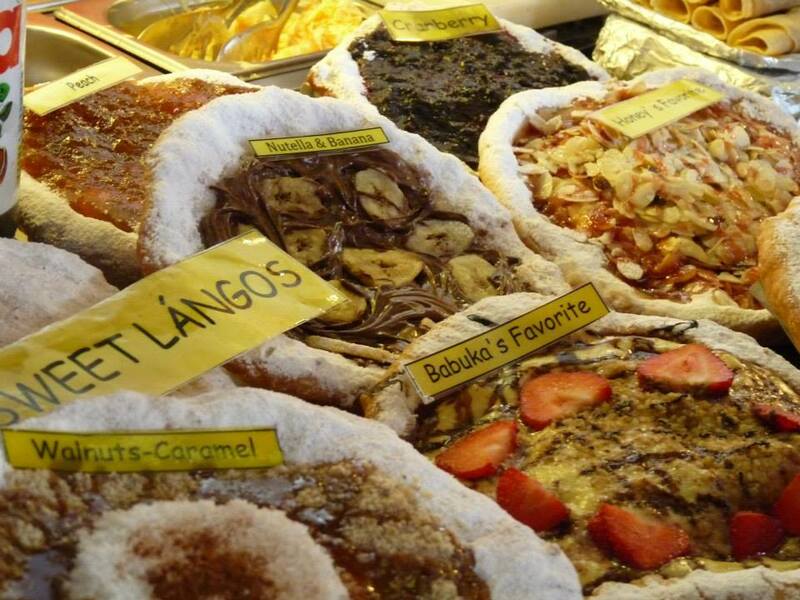 This Hungarian specialty is a deep fried flat bread made of a dough with flour, yeast, salt and water. This lovely looking snack is eaten fresh and warm, topped with sour cream and grated cheese, ham, or sausages, or -most frequently – without toppings, just rubbed with garlic. 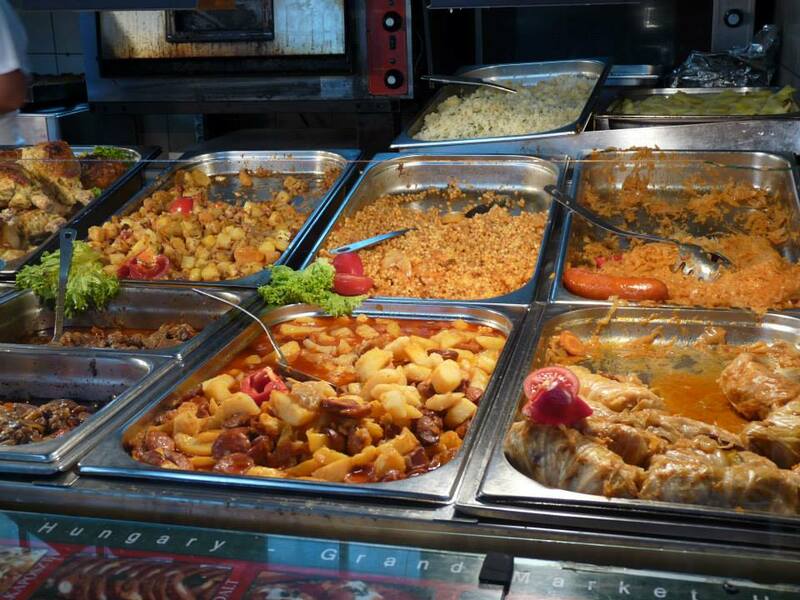 Other ingredients and accompaniments can be mushroom, eggplant and cabbage or for the sweet toothed, jam, chocolate, nuts and cream. 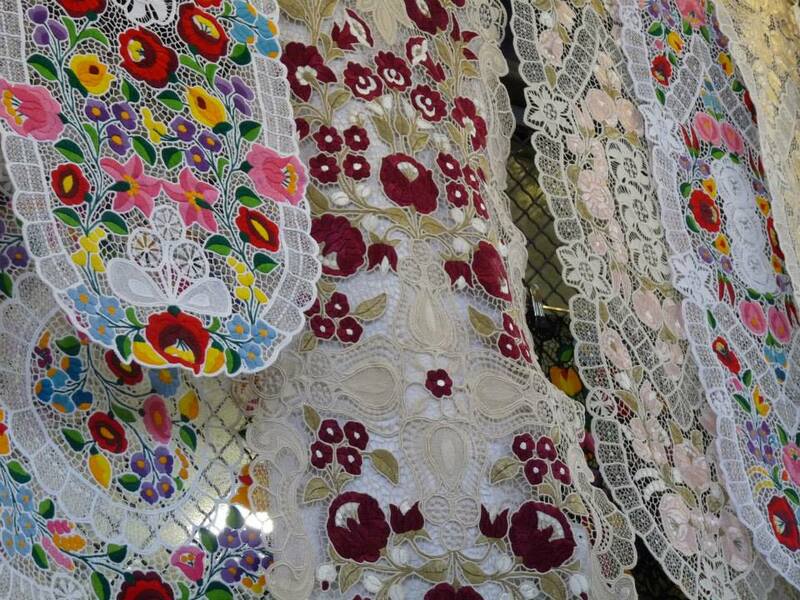 As well as the foody delights, there are also numerous stalls selling traditional crafts and souvenirs. 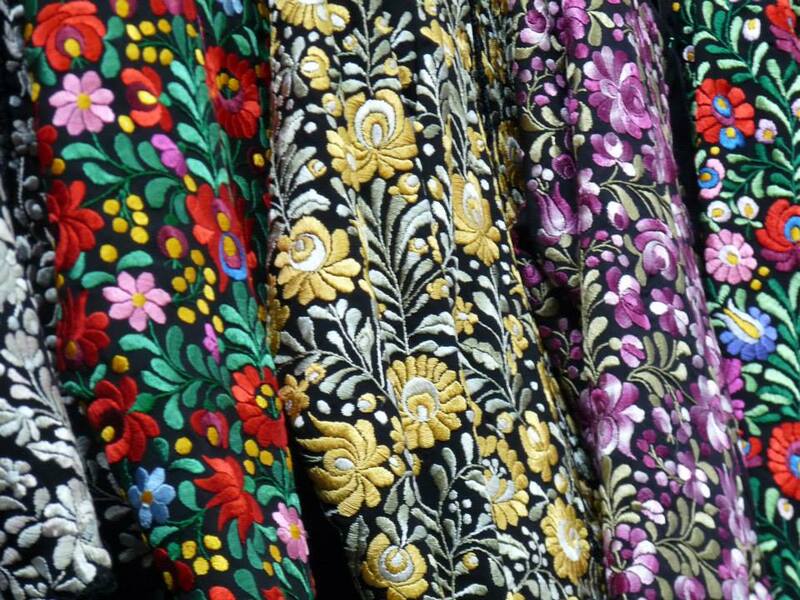 Rich embroidery and beautiful, colourful lace are staple gifts. 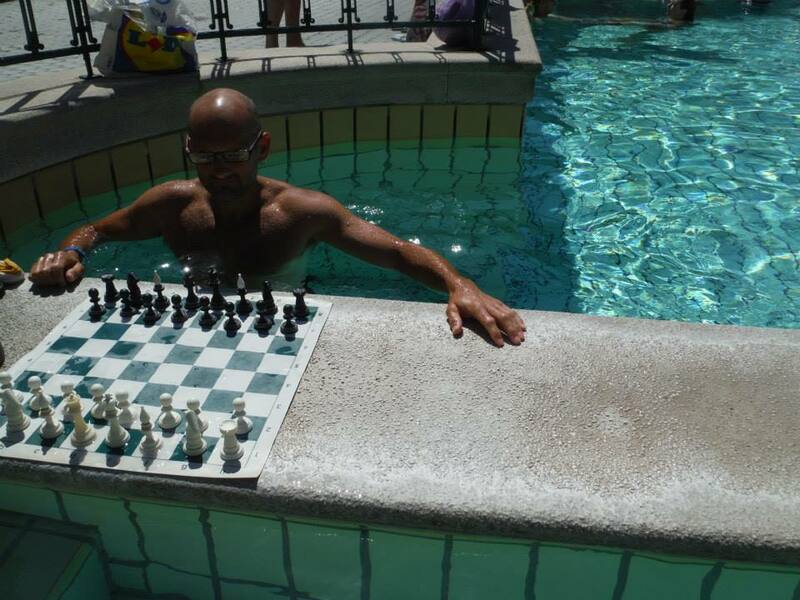 Budapest is famous for its hot springs and proliferation of spas (about 80 springs dotted around the city I believe.) The natural hot water is so bountiful that it is used for domestic hot water apparently!. 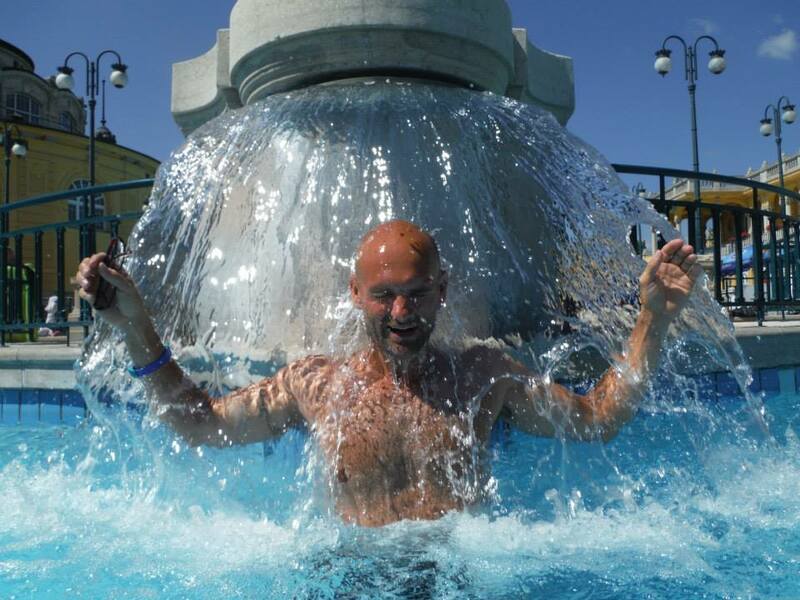 So you can’t possibly visit Budapest without indulging in at least one of its watery based fun palaces. 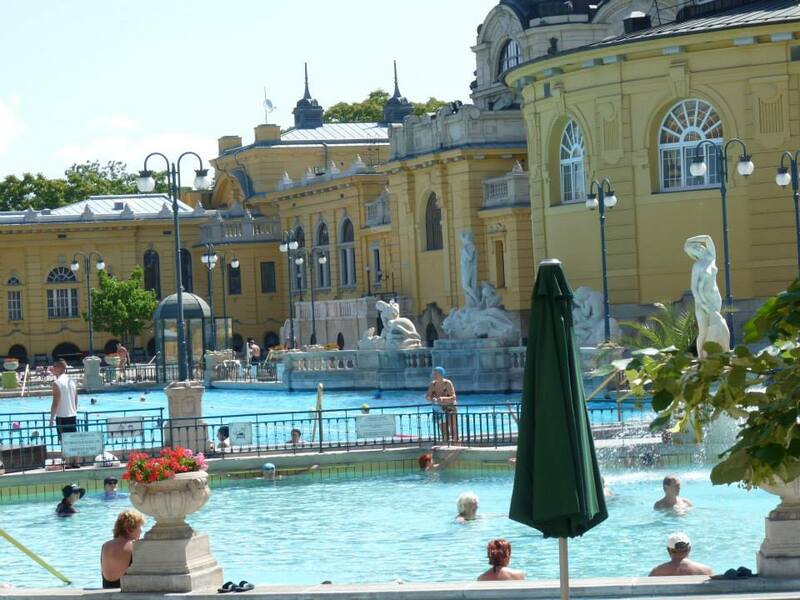 Today, there are 15 public thermal baths in Budapest, not counting the private thermal spas established in some of the posher hotels. There’s so many to choose from, from the stately fading grandeur of the old school grand dames such as Hotel Gellert to more modern, state of the art places. We booked a day pass that included a little cabin for storing our stuff for the day. You are advised to bring your own towels as there’s a hefty deposit for one of theirs. 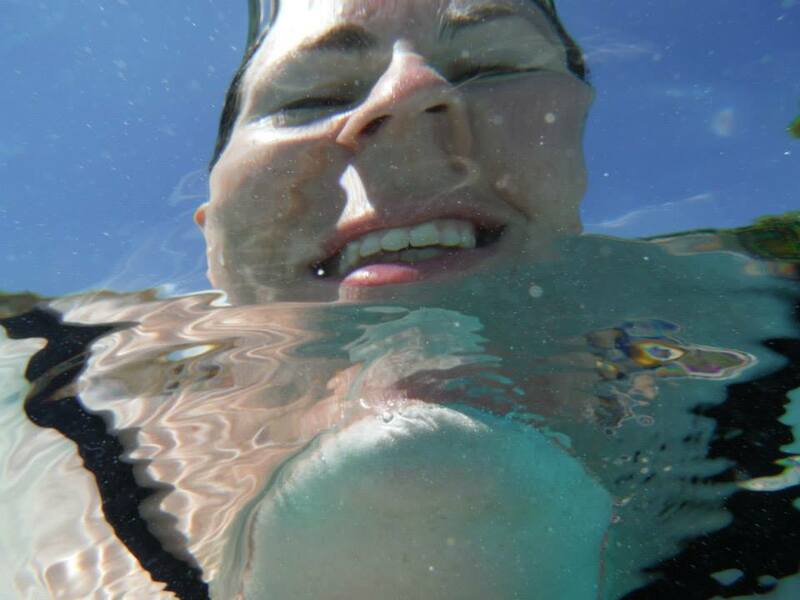 Also flip flops and a water proof camera are our recommendations! 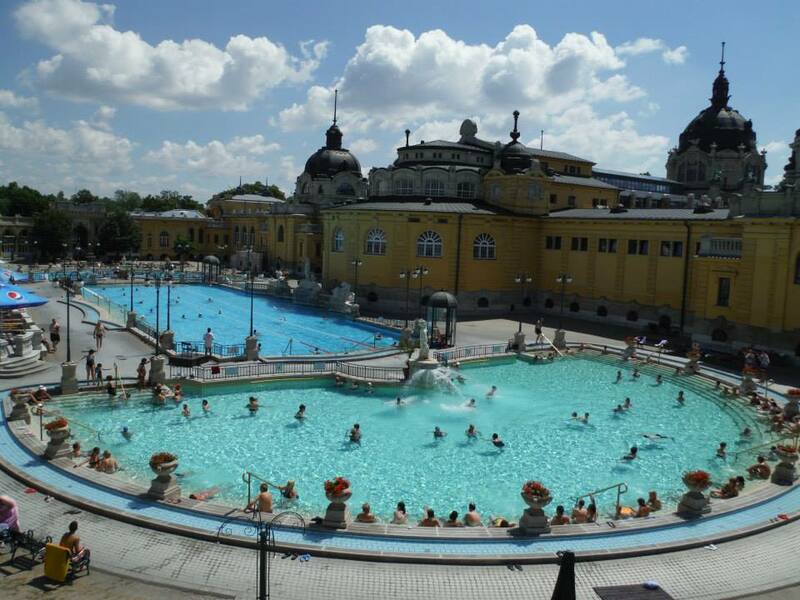 This sprawling complex is the largest medicinal bath in Europe and its water is supplied by two thermal springs – their temperature is 74 °C and 77 °C respectively. 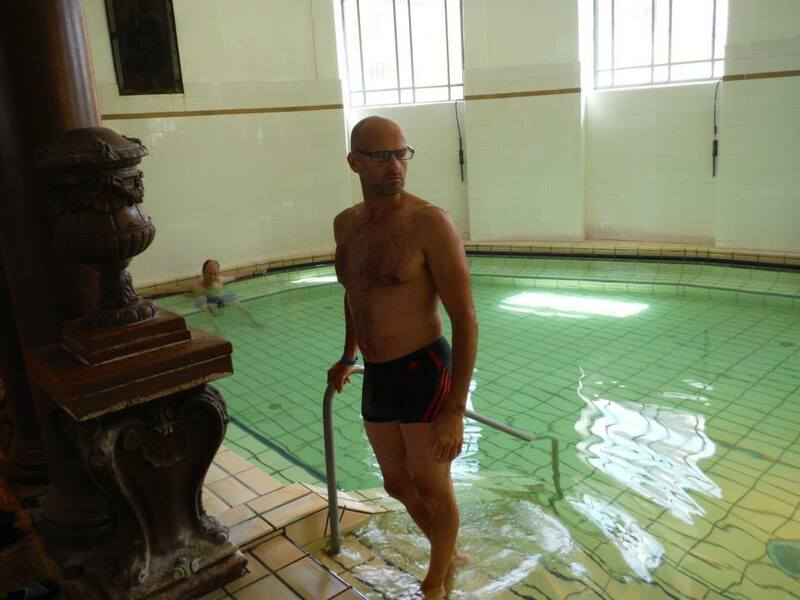 The spa, in planning since the 1880s was built in 1913 in an Neo-baroque style and was designed by Győző Czigler. Did I mention it’s very YELLOW!! 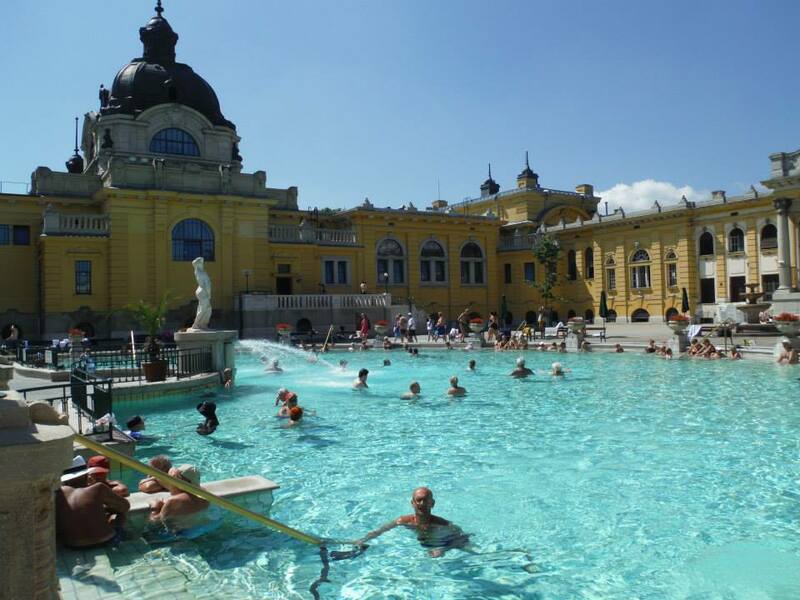 Construction cost an eye-watering 3.9 million korona and the baths saw more than 200,000 people visit in 1913 alone. Originally it had private baths, separate men and women’s steam-bath sections, and different male and female public baths. 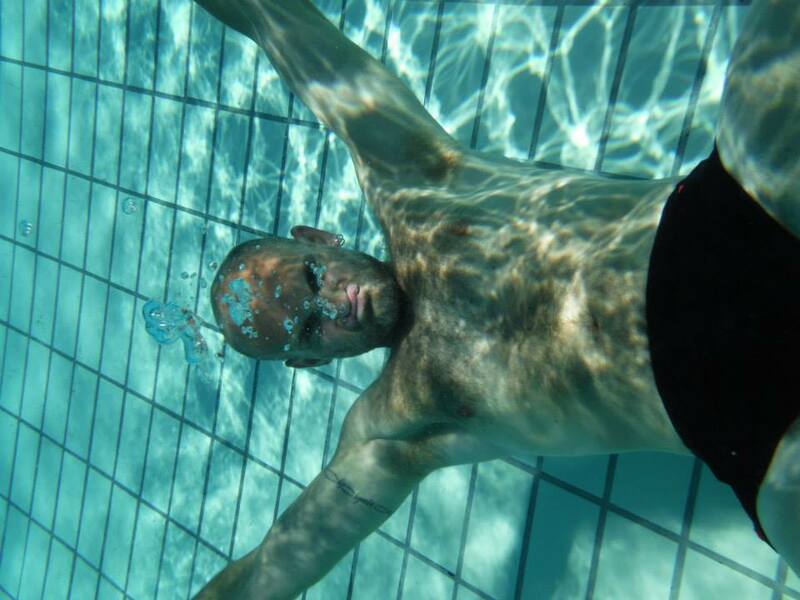 Although mixed bathing is now the norm, inside it still retains its old fashioned feel with room after room of pools, all varying sizes and temperatures. 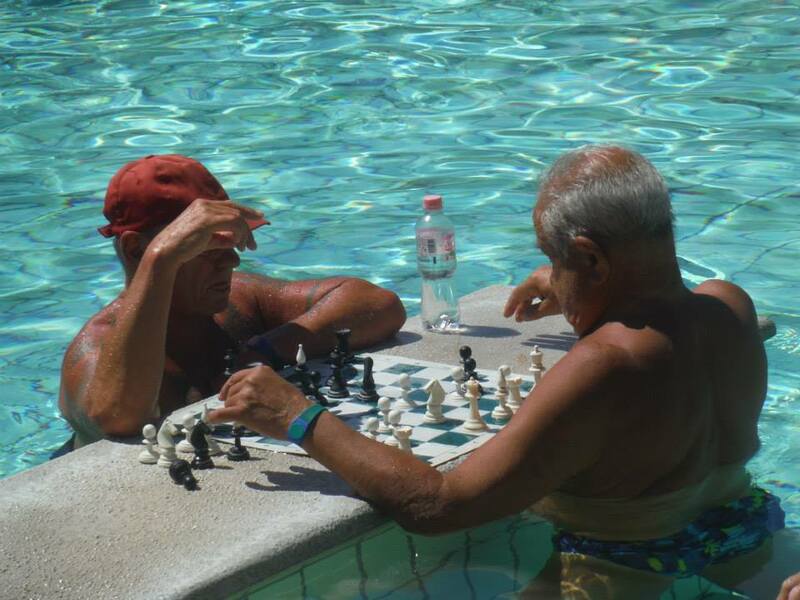 One of the quirkiest bits of the baths are the chess boards in the water that always attract a certain type of elderly man in small shorts. . . The complex was expanded in 1927, and it still boasts three outdoor and 15 indoor pools. 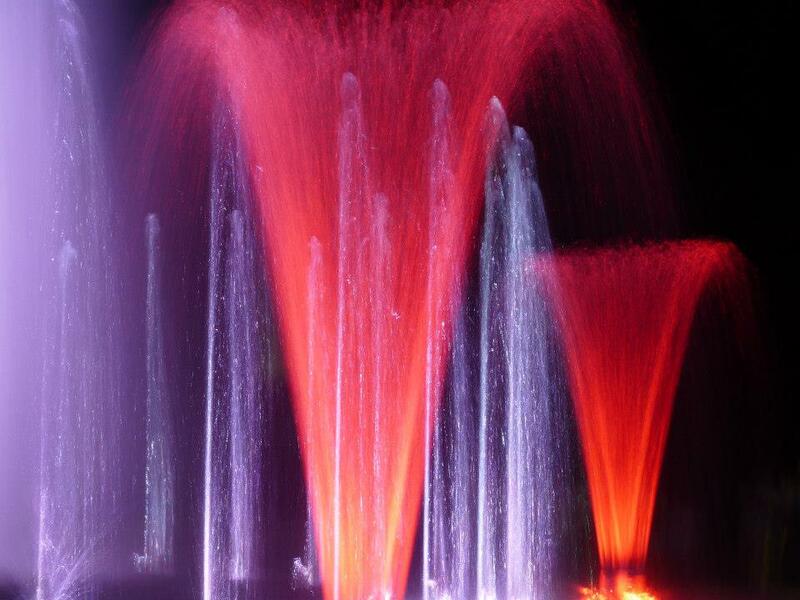 After its expansion, the thermal artesian well could not fulfill its purpose, so a new well was drilled in 1938. 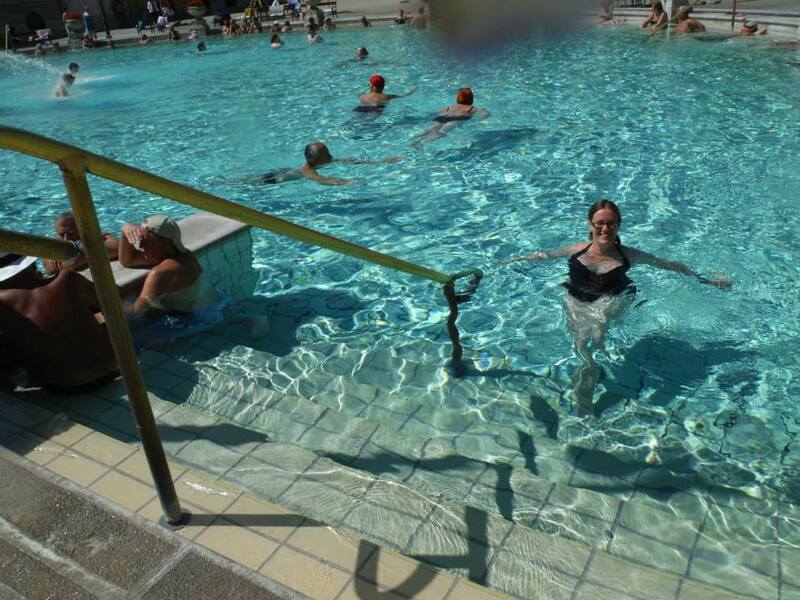 Here’s the outdoor section of the baths, bathed in sunshine and just starting to fill up with punters. We arrived early to enjoy the pools while they were still quiet – by mid day every crevice was crammed with swimmers and sun seekers. 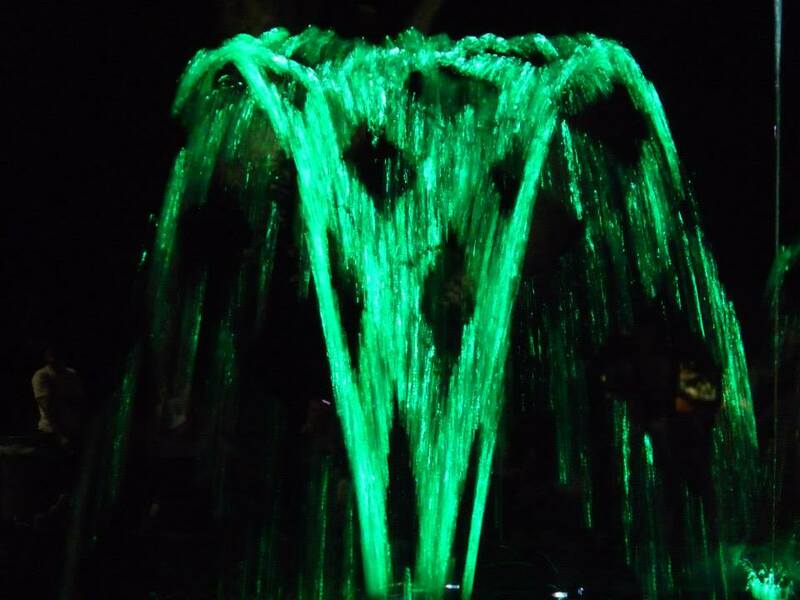 Between 1999 and 2009 a full restoration took place and it attracts thousands of visitors, eager to soak up the rays in the pools of varying temperatures. 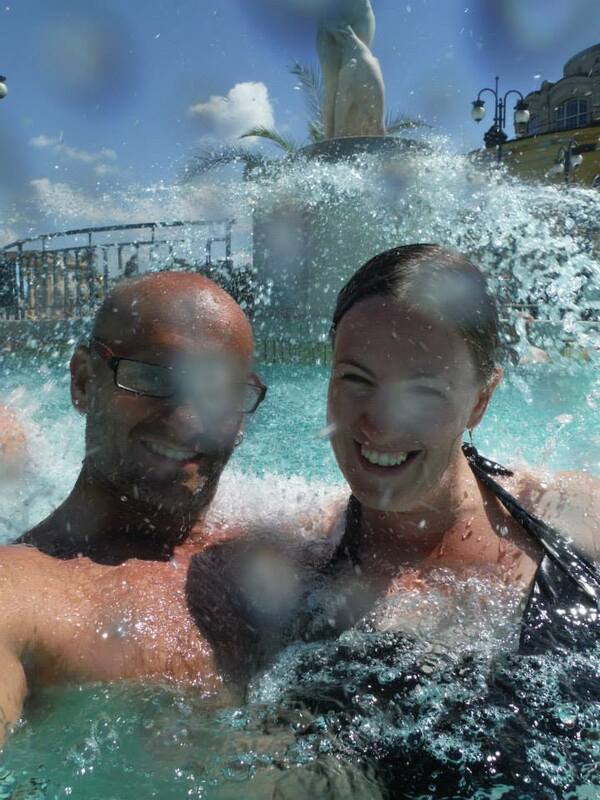 Here we are taking the plunge and enjoying / enduring the various water features and whirly river rapids. The rushing water, even though it is heated, is really rather lovely on a sunny Hungarian day. 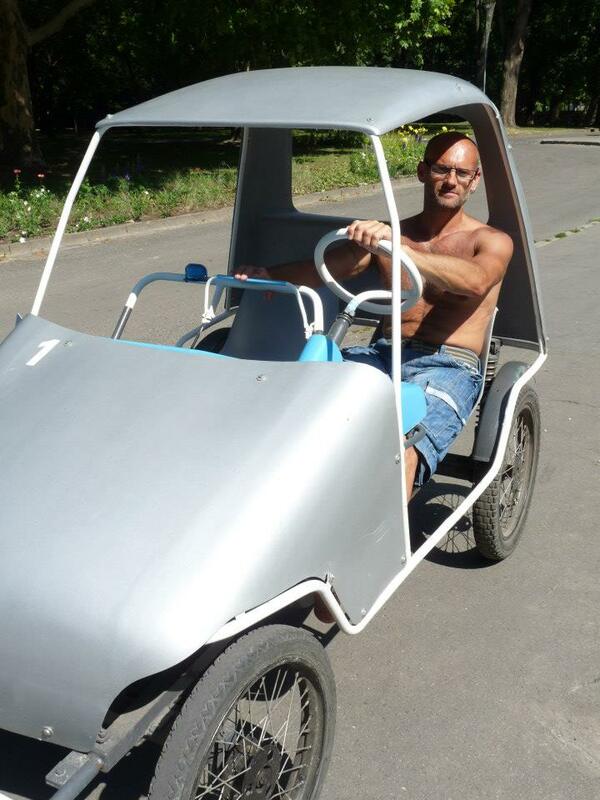 See you later dear readers!!!!………. 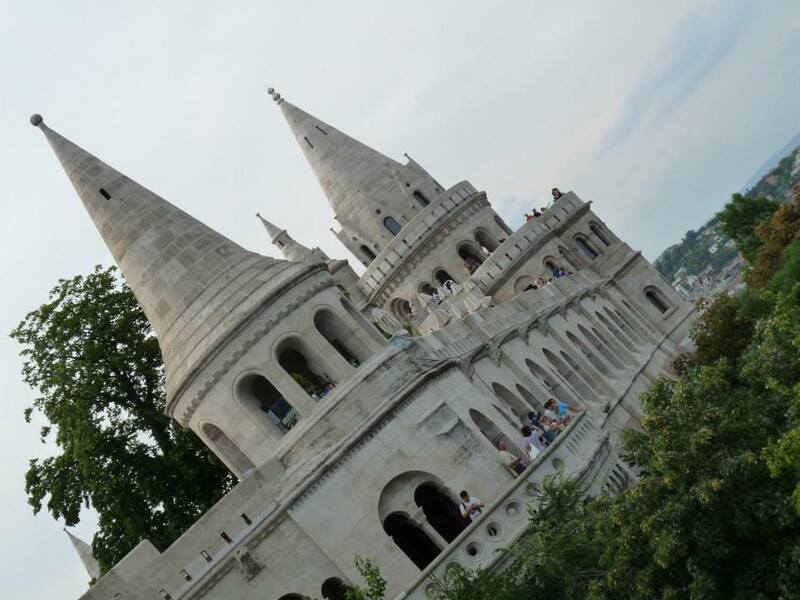 After admiring the fantasy Fisherman’s Bastion and taking gazillions of photos of the tiled roof of the nearby church, we headed further into the old town. From the adorably cute “eye” windows that feature heavily in the local architecture, to reminders of war time damage, the town is full of interesting features. 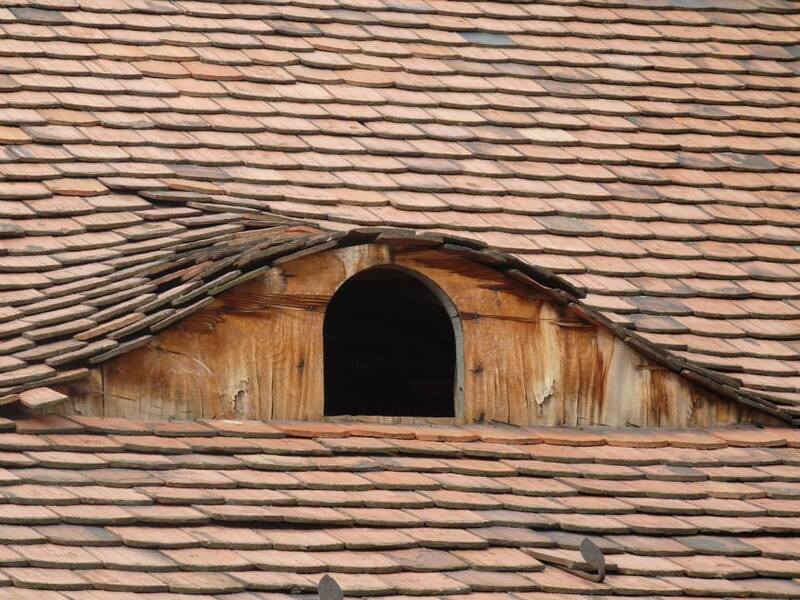 Here’s one of the sneaky looking window eyes – super shifty looking! As you wander through the streets you will come across the Church of St. Mary Magdalene. 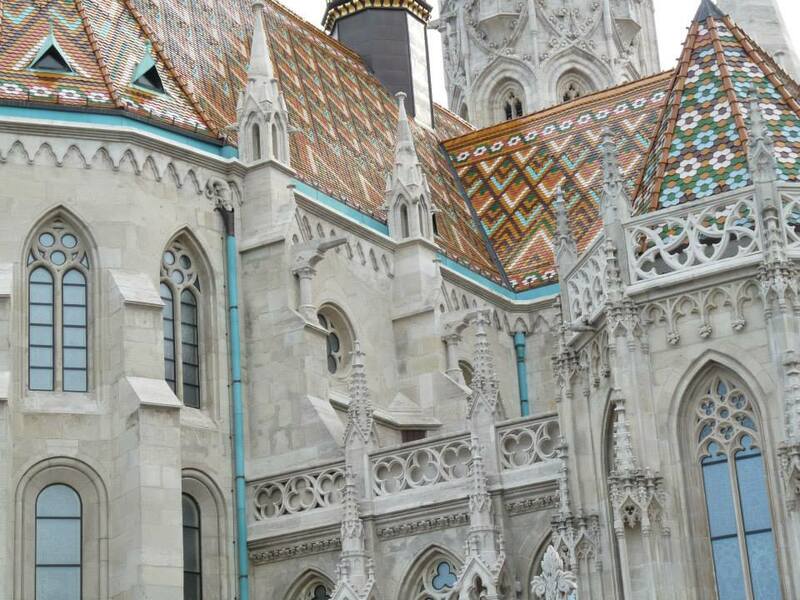 The Church, dating from the middle of the 13th century, originally served as the parish church for the Hungarian citizens of the town as only the German residents were allowed to use the stunning Matthias Church. The church was all but destroyed during World War Two and the proceeding Communist regime and only the bell tower remains standing today. 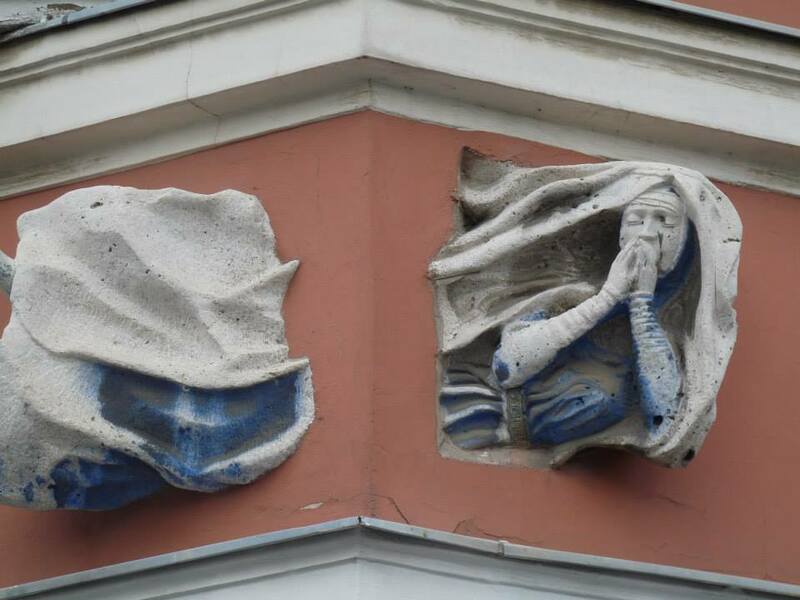 Close to the church is this amusing flying Nun sculpture, high up on the corner of a building.Dressed in the uniform of the Clarissa nuns, she breaks through the walls of the building which was the home of the nuns for many years. 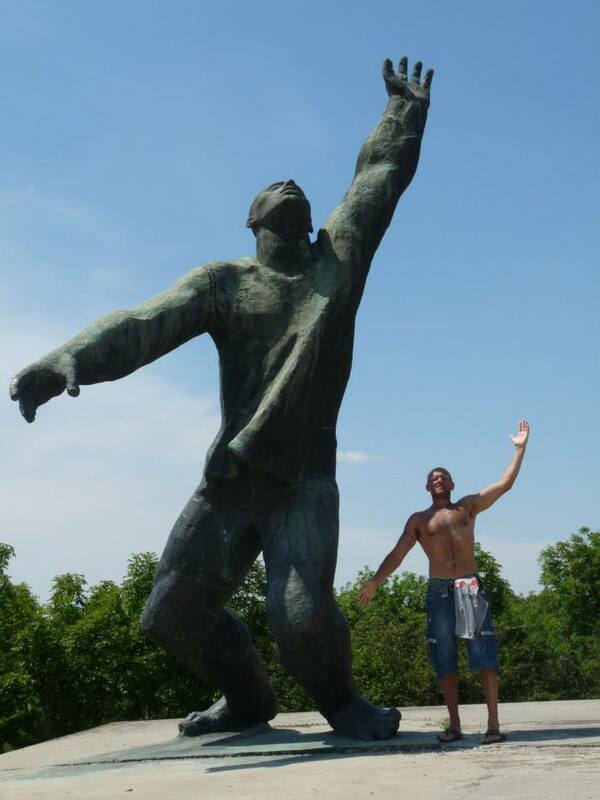 The statue was created by Miklós Melocco in 1977. As we head back down the hill towards the river we encounter another of the gorgeous gilded bulb style churches that litter the city. 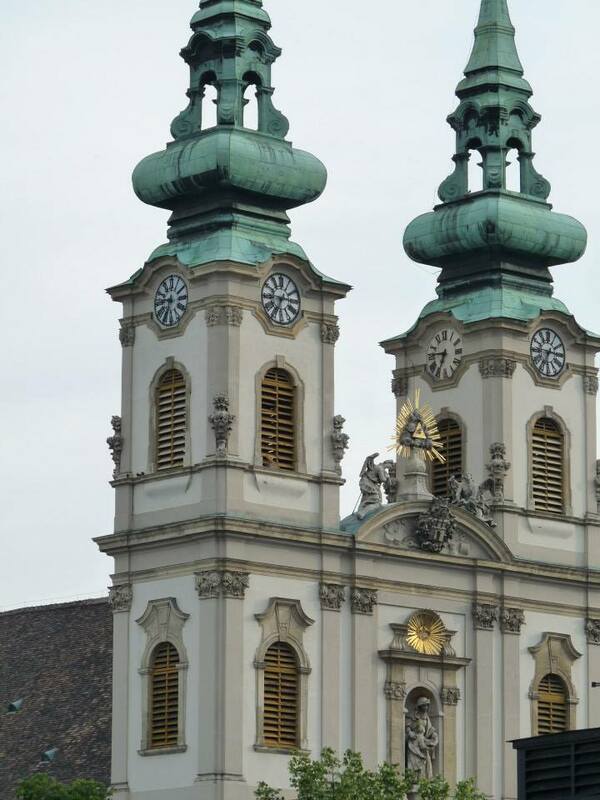 This one is the Church of St Anne and features twin, green onion shaped bell towers. 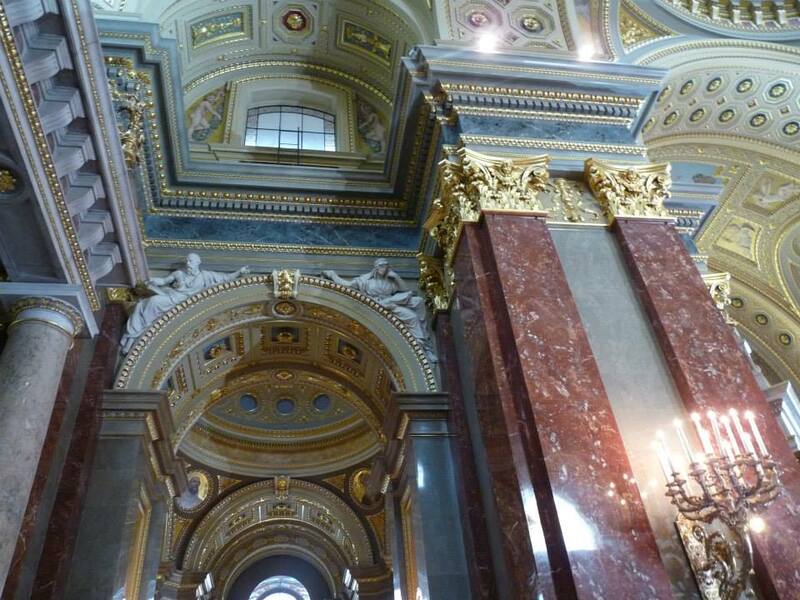 It’s one of the finest baroque buildings in the city. 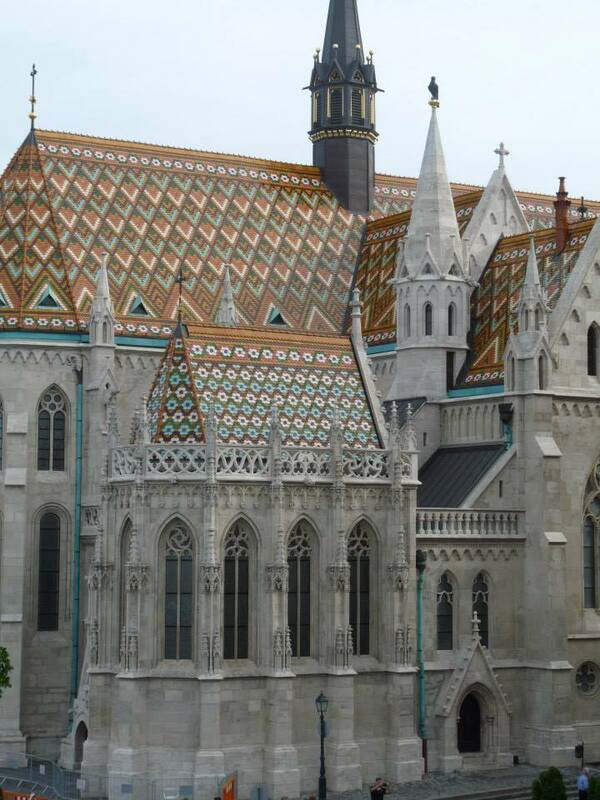 Work began on the church in 1740 and was finished in 1761 by Mátyás Nepauer. 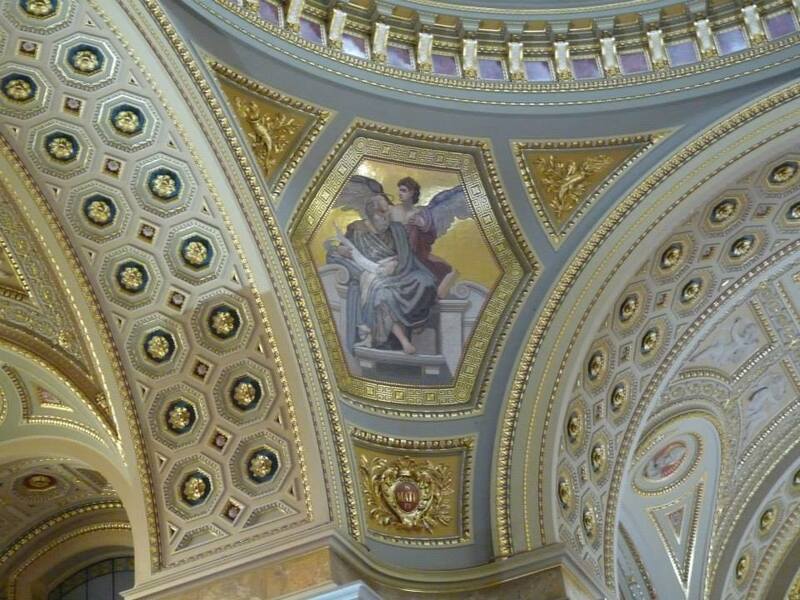 On the top of the main gate symbolic figures of faith, hope and love greet the visitors, above them the coat of arms of city of Buda and in the upper niche statues of St. Anne and Mary guard the entrance. The church has suffered through wars, floods and earthquakes and was finally restored in 1970-84. 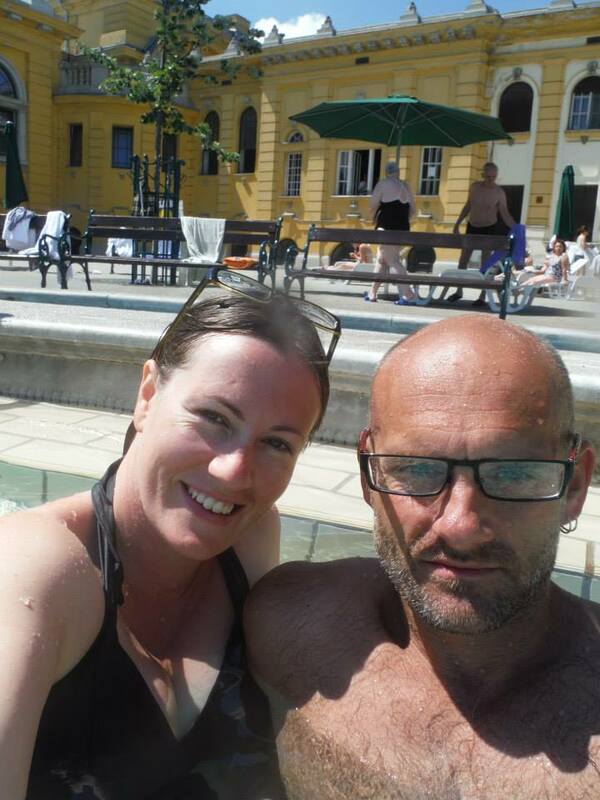 Next up – the famous Chain Bridge, a glut of statues and a chillaxing day at the spa! 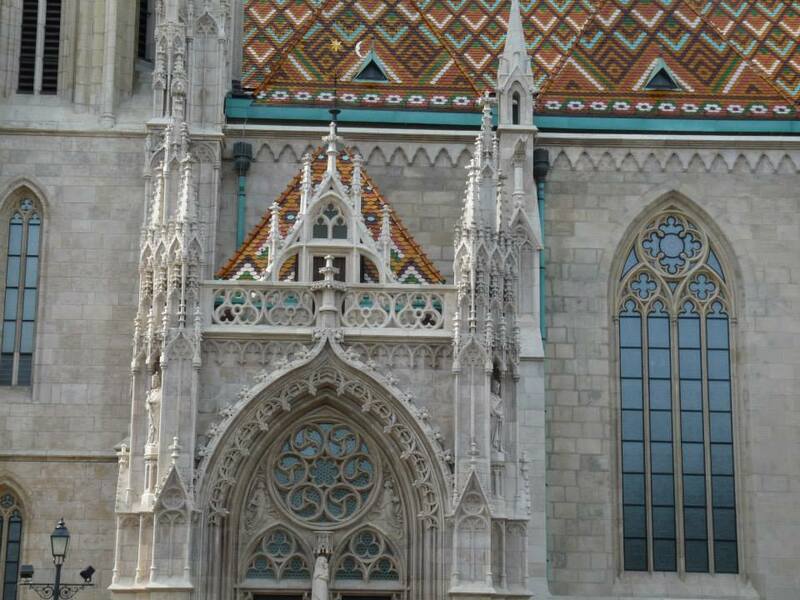 Budapest is literally a city of two halves. 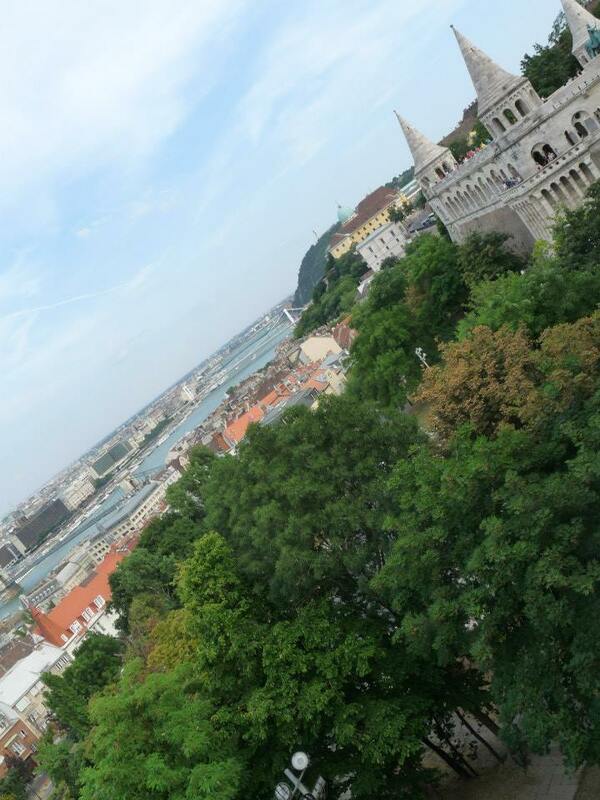 Old Buda on one side of the mighty Danube and new comer Pest on the other. 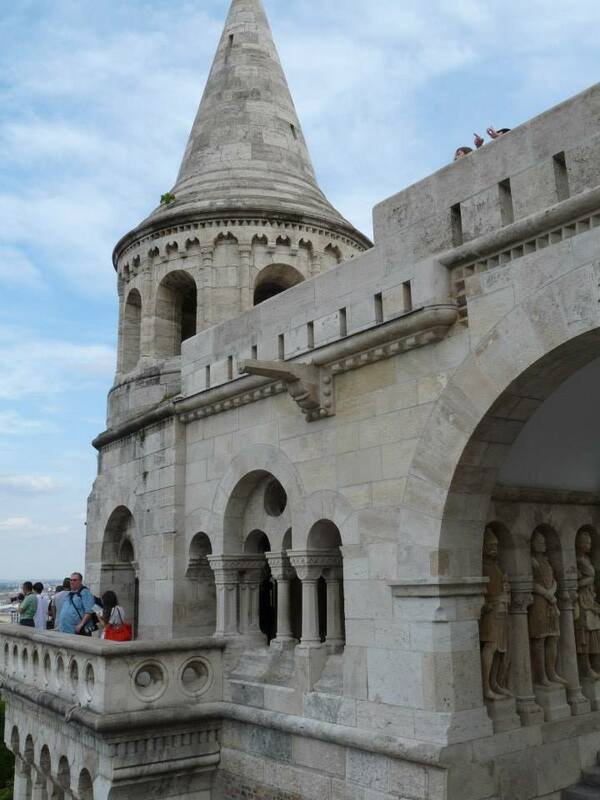 Buda is the former capital of the Kingdom of Hungary and sits on the west bank. Budapest is made up of 23 districts, all numbered clockwise, in widening circles. 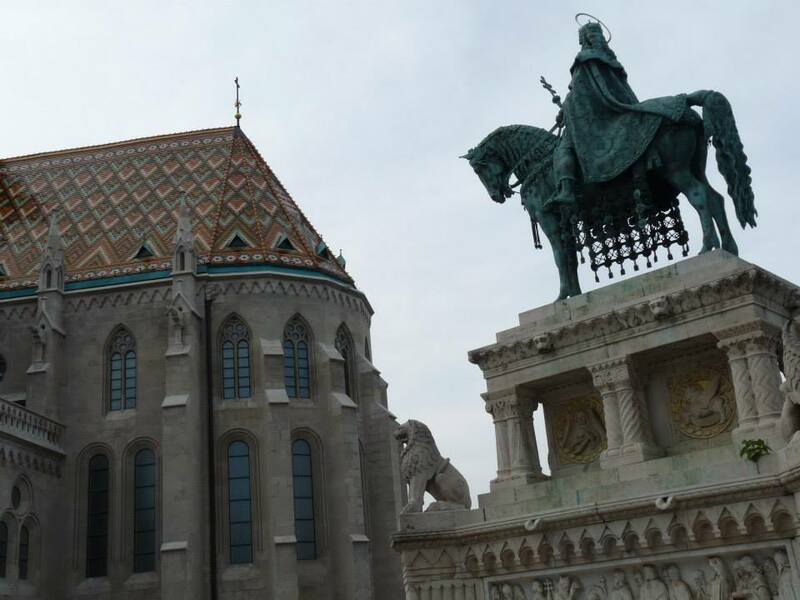 District 1 (The Castle District) is home to some of the most impressive of the city’s old architecture including Buda Castle, the Citedella, the quirky Fisherman’s Bastion and the glorious Matthias Church. 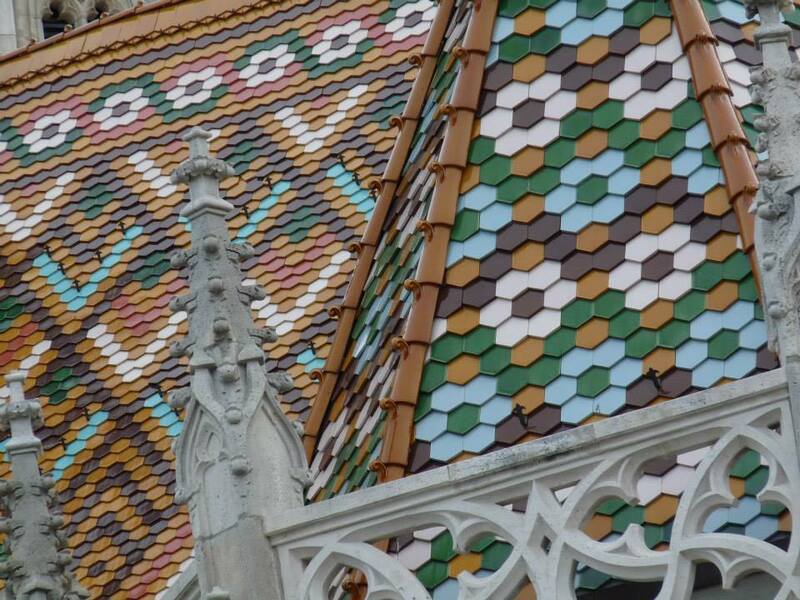 Below are some snaps of the gorgeous geometric tiled roof of the church and its ornate spires. 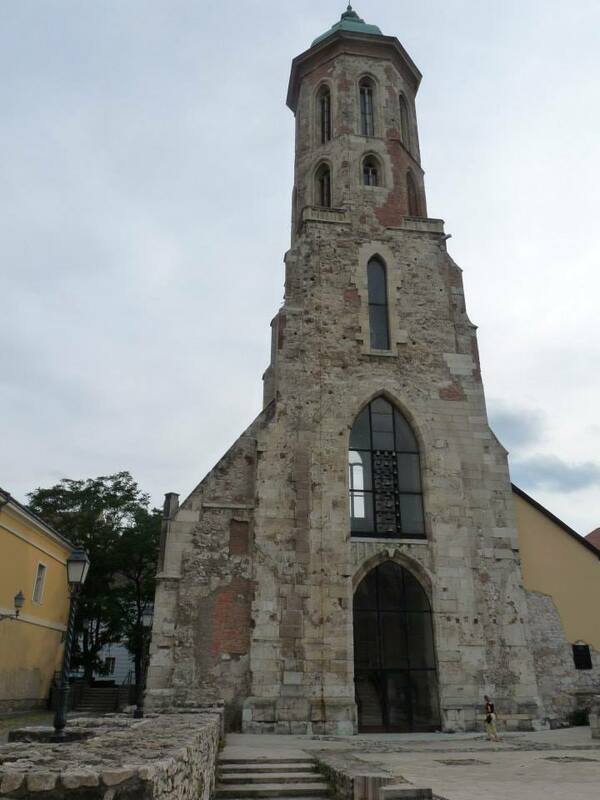 The earliest remains of the church dates back to the 13th century and its name refers to King Matthias Corvinus who expanded and decorated the building in Renaissance style. He also added the 60 metre high southern tower called the Matthias bell tower with his coat of arms a raven holding a golden ring in its beak. The church was almost totally destroyed by the Turks but a new church was constructed of the remains in Baroque style. In the early 18th century the church suffered more damage and it was finally restored in its current Neo-Gothic style by Frigyes Schulek in 1873-96. 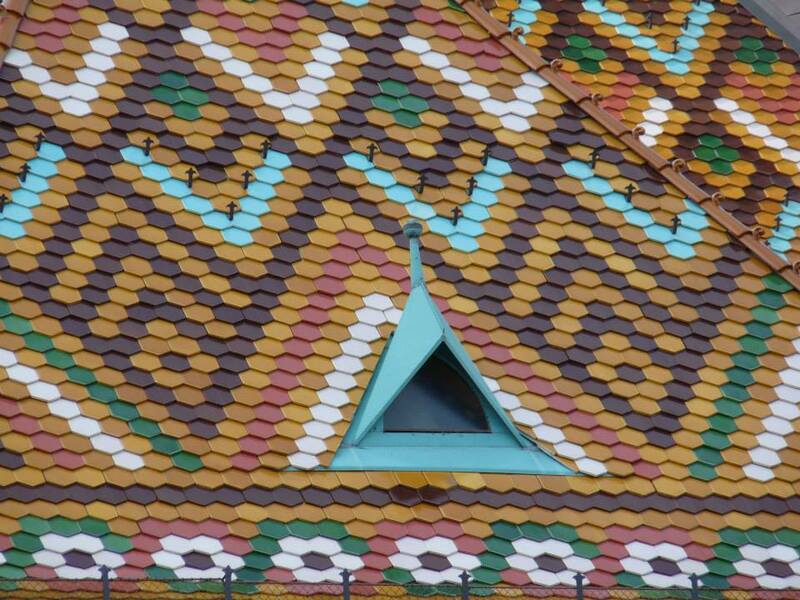 Schulek added the beautiful tiled roof and other artists added stained glass windows and frescos. 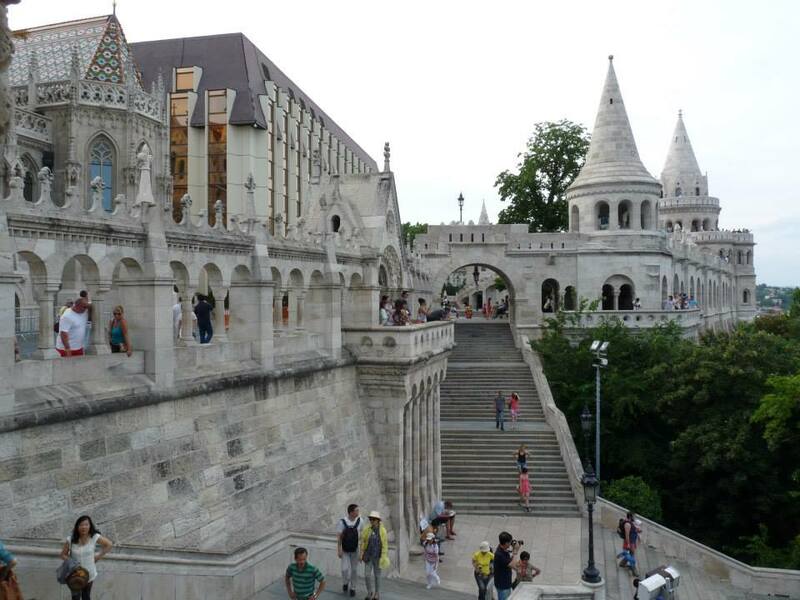 Close to Matthias church is the ornate and quirky Fishermen’s Bastion (Halászbástya) – again designed by Frigyes Schulek in neo-Romanesque neo-Gothic style. The seven towers, while like a Disney style fantasy, actually represent the seven tribes of Hungarians when they settled down by the Danube in the Carpathian basin in 896. 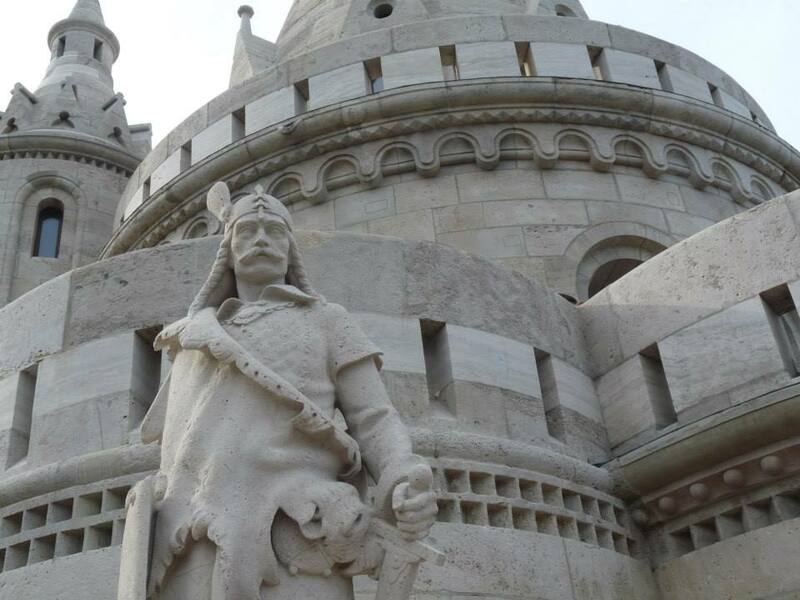 The Fishermen’s Bastion never was used for military defensive purposes, it was created for only decorative reasons. 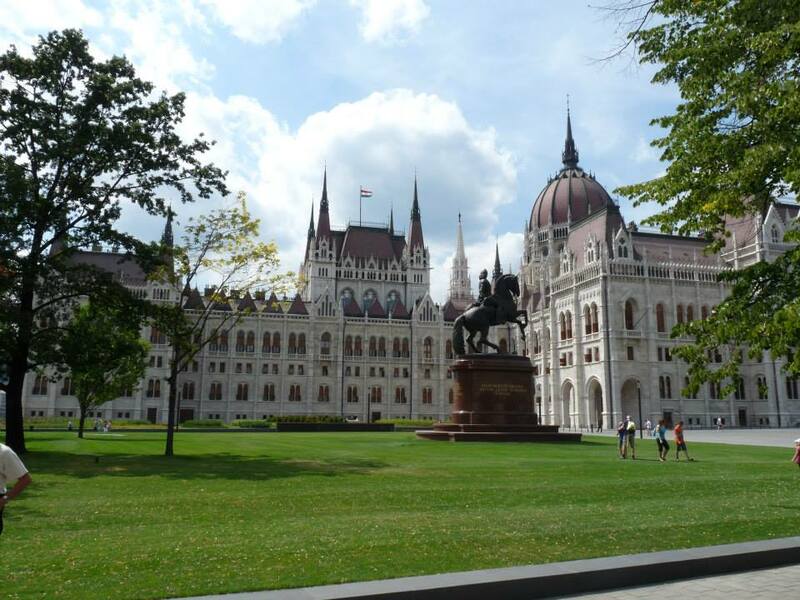 The building has many whimsical turrets, terraces, parapets and stairways giving an amazing view Pest, the Parliament building and the river Danube. 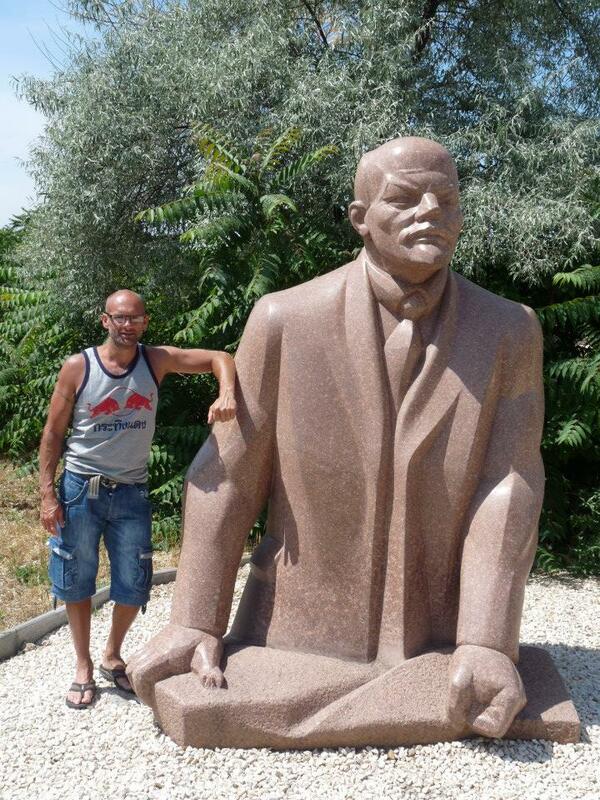 I am not a good student of history but during my travels I learn more about the world and its past horrors. 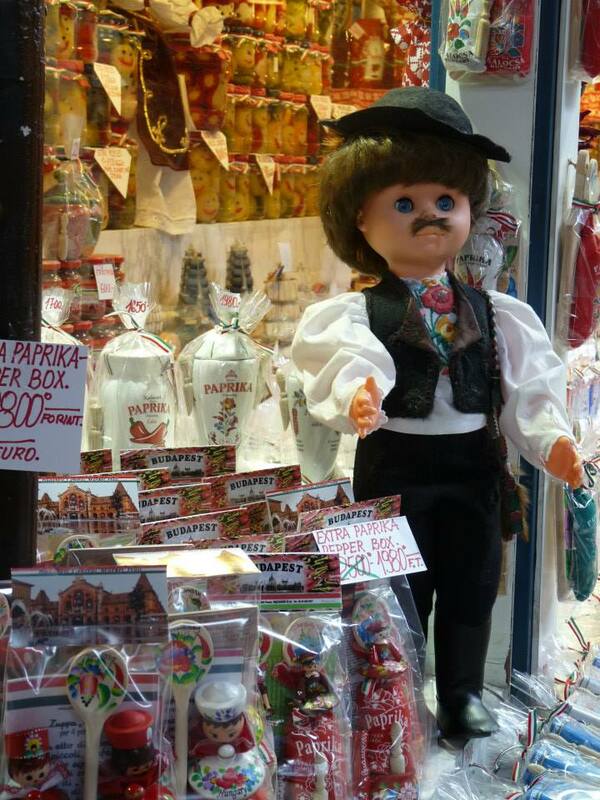 Hungary has its own share of sadness and this is evident in every corner of the capital city. 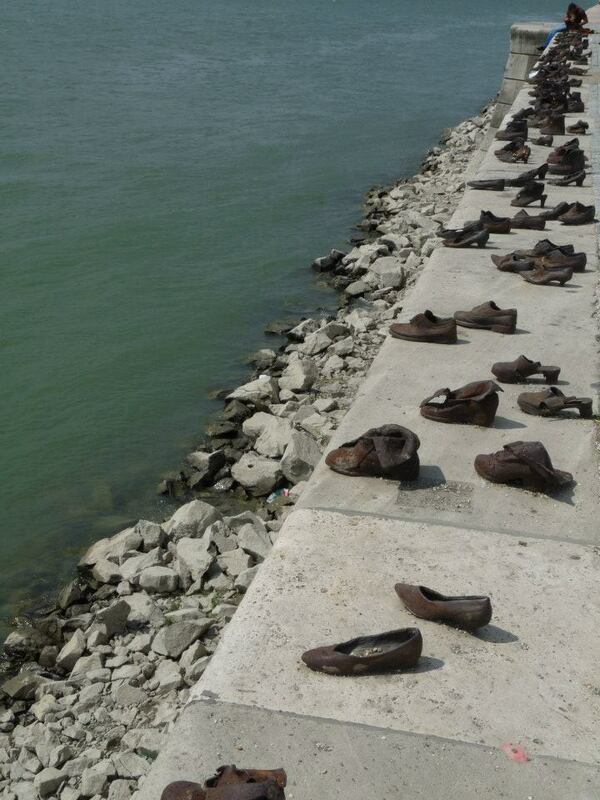 One of the most poignant memorials to World War Two and the price that Hungarian Jews payed is a series of 60 pairs of bronze cast shoes along the bank of the Danube. 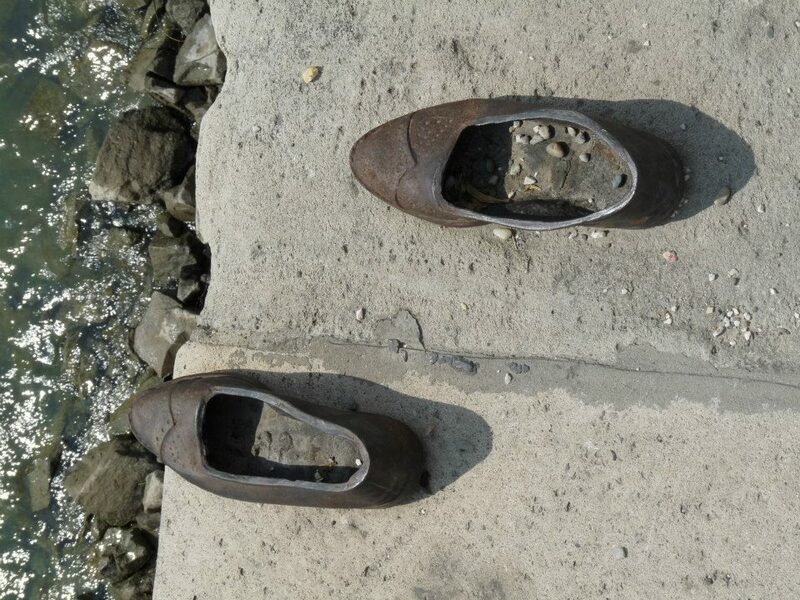 From formal work brogues to tiny children’s shoes, they stretch out along the river. 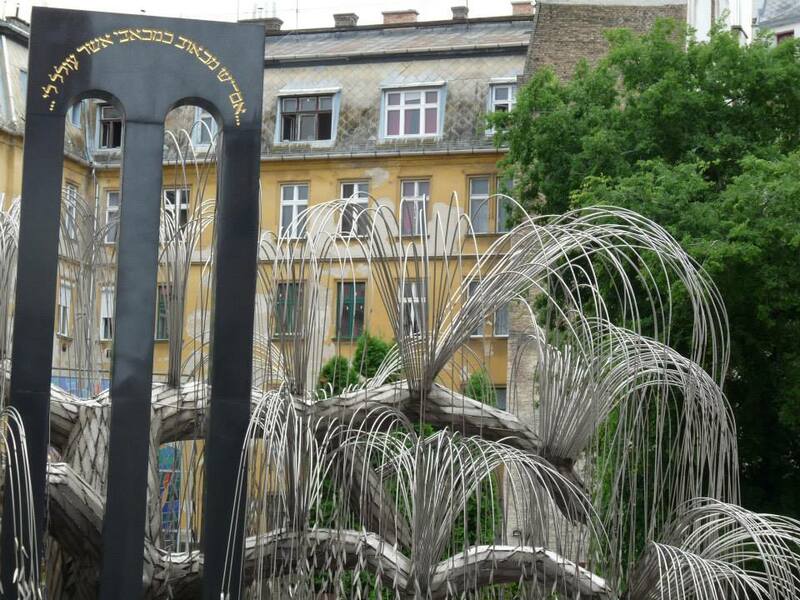 Conceived by film director Can Togay and sculptor Gyula Pauer the installation commemorates the Jews who were killed by fascist Arrow Cross militiamen in Budapest. 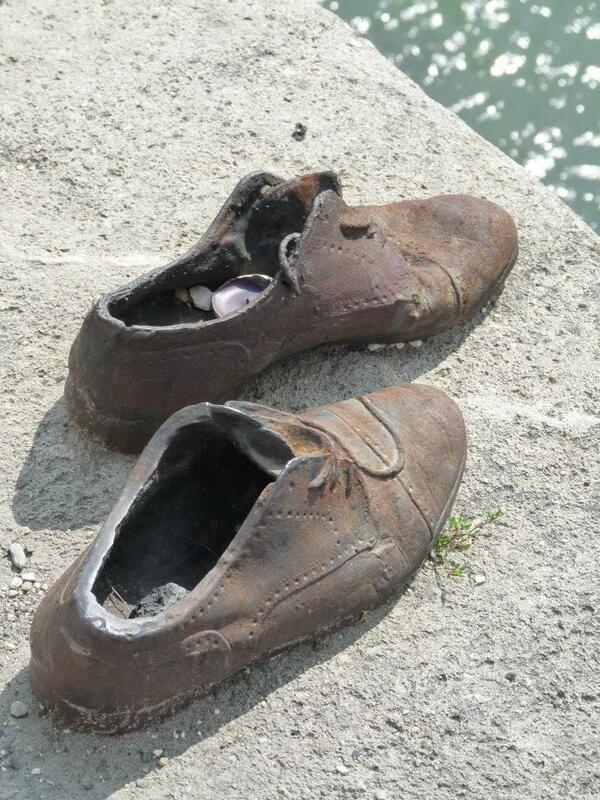 They were ordered to take off their shoes, line up and were shot at the edge of the water so that their bodies fell into the river and were washed away. 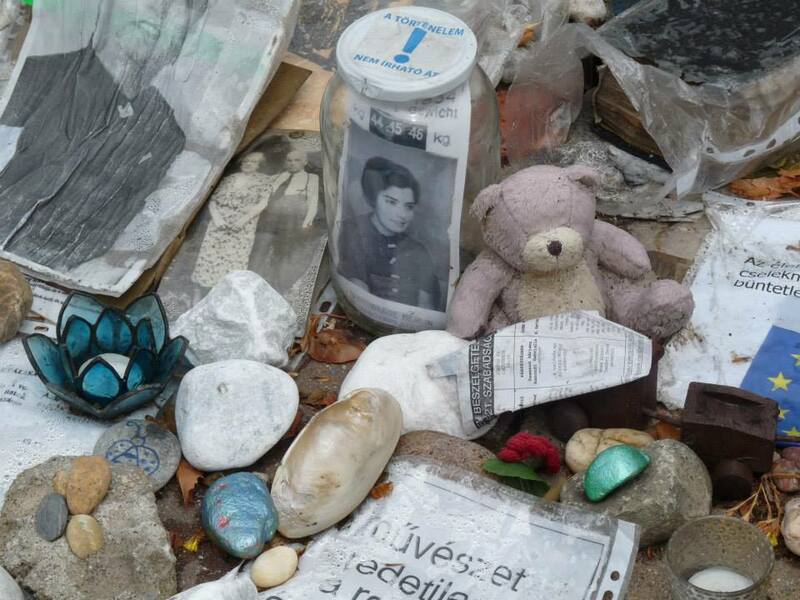 Later on we visit the Jewish Ghetto area of Budapest and see another memorial to Jewish families who perished. 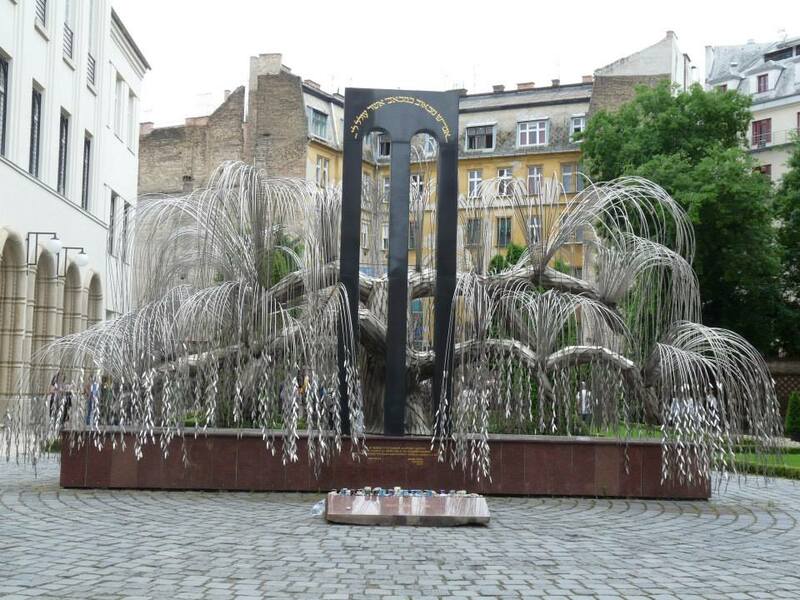 Next to the Central Synagogue (Nagy Zsinagóga) is the Weeping Willow Memorial in the Synagogue’s garden of remembrance. Designed by Imre Varga, each of the weeping willow’s leaves bears the names of some of the 600,000 Jews murdered during the Holocaust. Made of silver and stainless steel it echoes the shape of an upside down Menorah – the seven armed candelabra that is the symbol of Judaism. 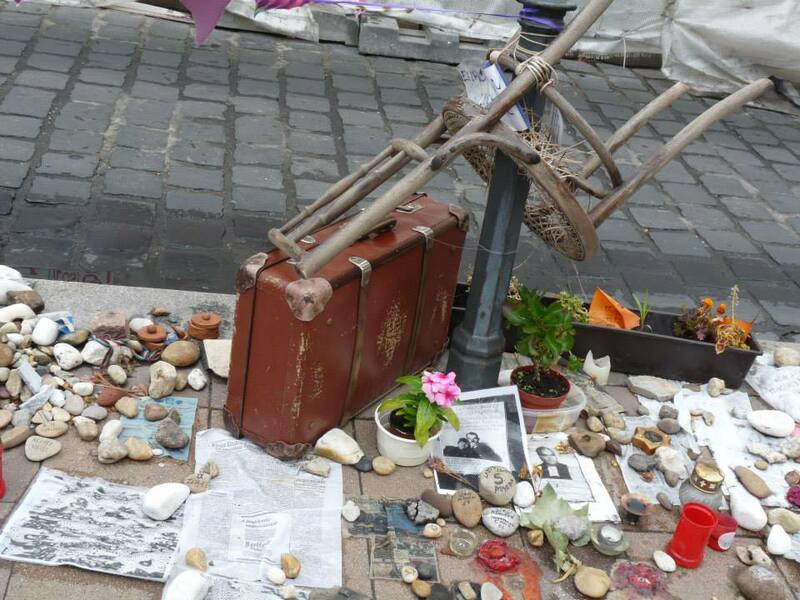 It seems that the legacy, controversy and misrepresentations of the truth of what happened to the Hungarian Jews, lives on, with protesters decrying a new memorial that is currently being built. 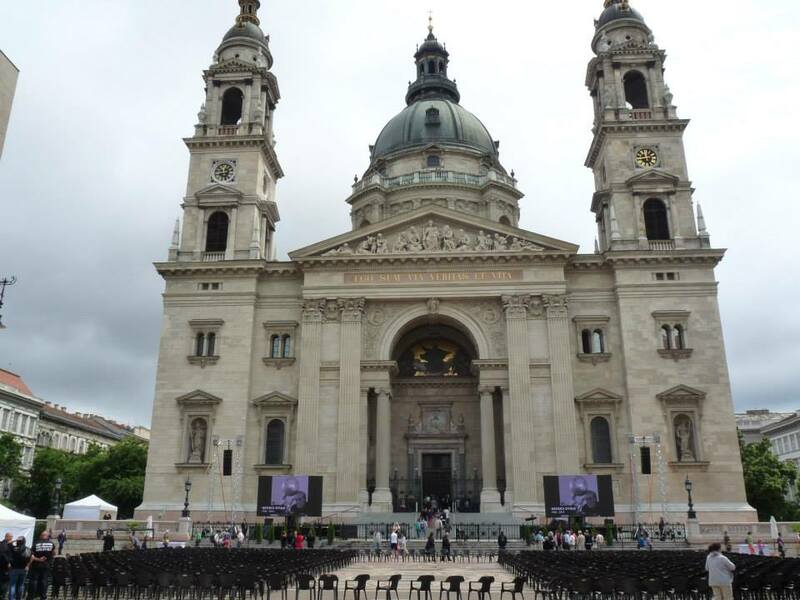 The Freedom Square monument will pay tribute to “all Hungarian victims with the erection of the monument commemorating the tragic German occupation and the memorial year to mark the 70th anniversary of the Holocaust,” according to the Hungarian Government Information Center. 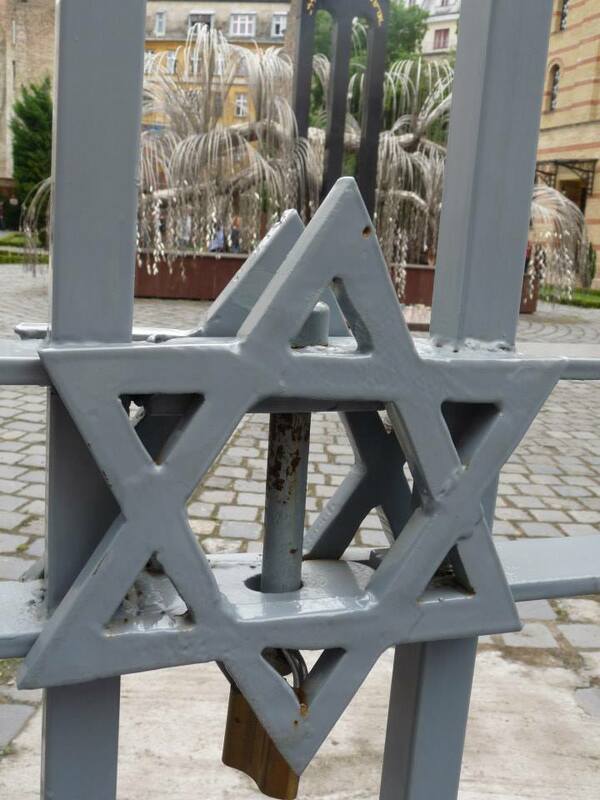 However Jewish organizations and historians say the new memorial absolves Hungarians of their active role in carrying out the deportations of Jews to Nazi death camps. 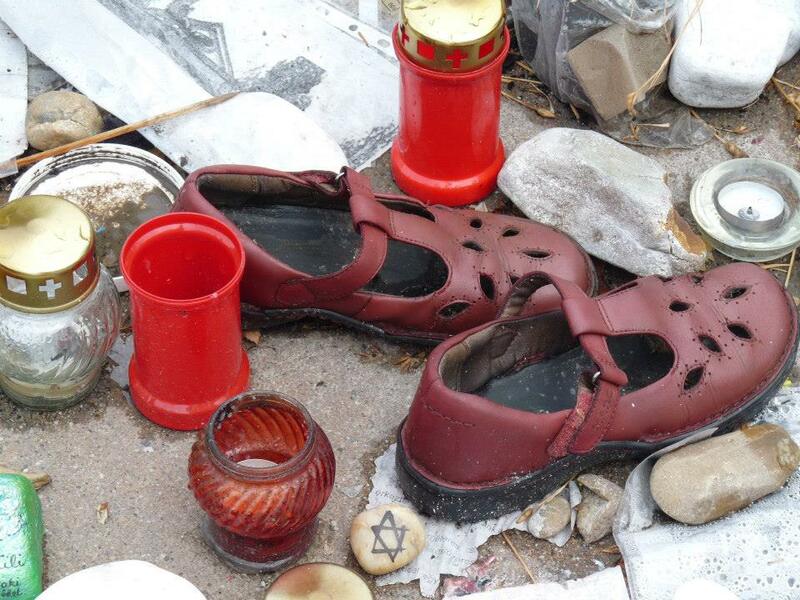 Protestors have set up their own shrines to lost loves ones, with personal items such as photographs, shoes and clothes, in front of the new memorial site. These are constantly removed only for them to be rebuilt. 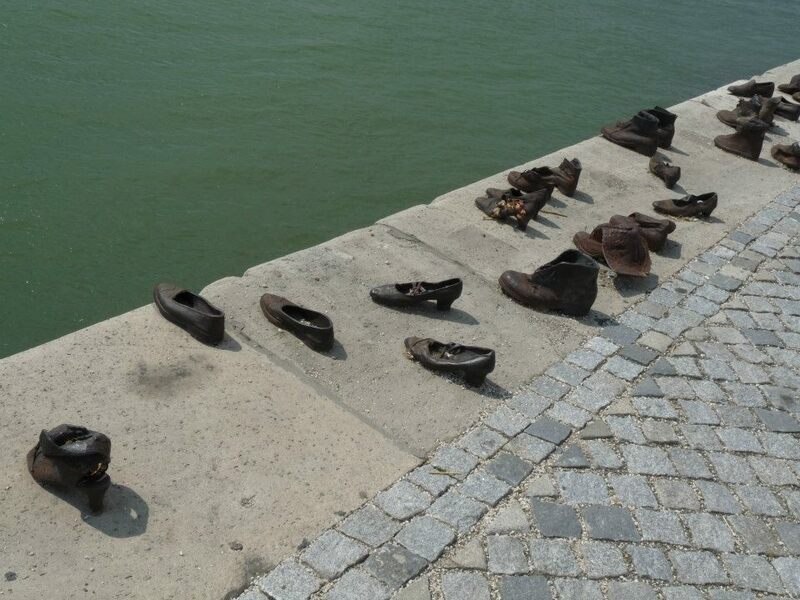 Some 600,000 Hungarian Jews perished during the Holocaust, almost all after the German occupation began on March 19, 1944. After a delightful few days of puttering around Bratislava we hop on the train for a few days in Hungary’s capital city Budapest. I was unaware that although Budapest became a single city with its unification on 17 November 1873, it is essentially three different towns separated by the Danube. 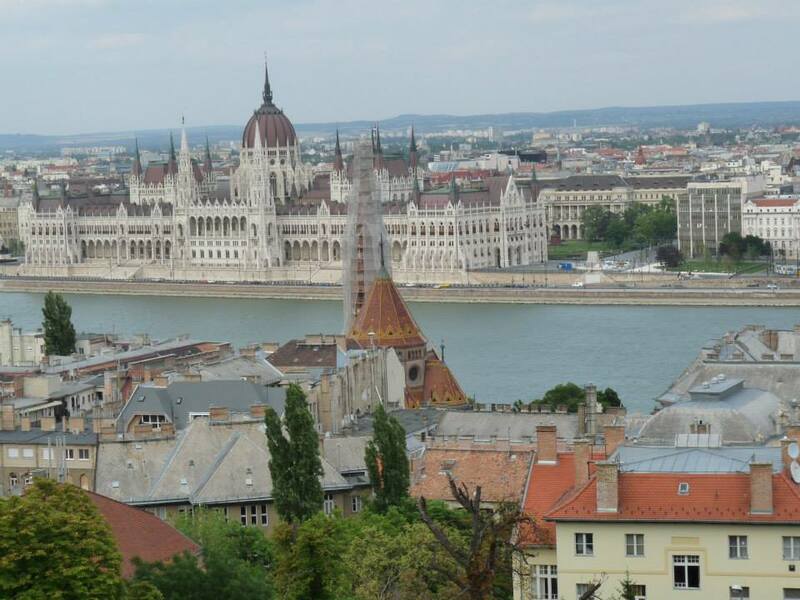 Buda and Óbuda – the old towns – on the west bank, with Pest, the more modern city, on the east bank. It’s about two and a half hours via train between the two cities and trains run frequently. We stayed in the incredibly stylish Hotel Parlament and as the name suggests it is just a short walk to the impressive Parliament buildings. Here’s a quick look at the incredible buildings themselves. 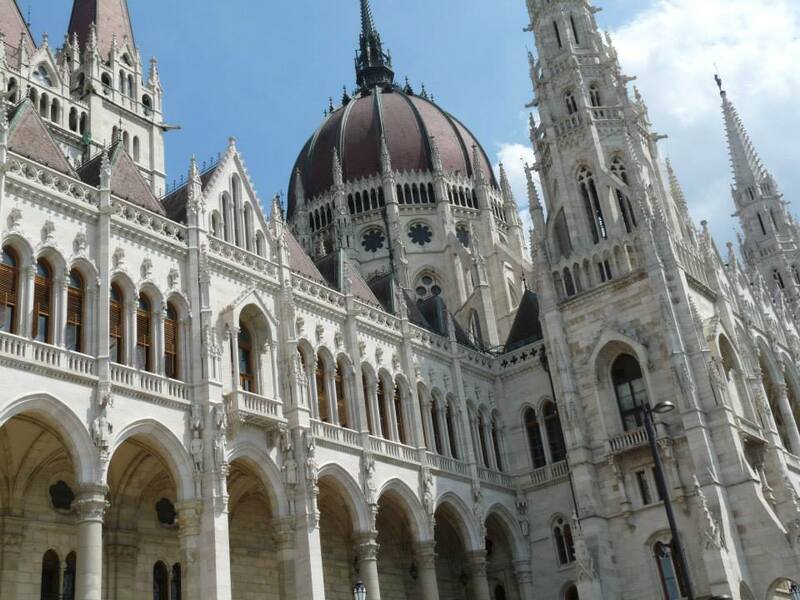 The Parliament Building is in the Gothic Revival style; it has a symmetrical facade and a central dome and 242 sculptures on the walls. 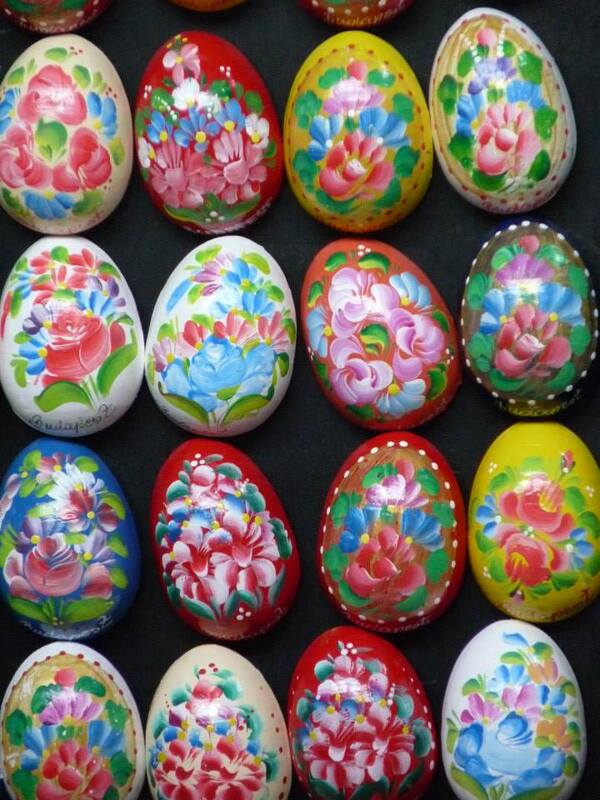 About one thousand people were involved in construction, during which 40 million bricks, half a million precious stones and 40 kilograms (88 lb) of gold were used. During the Communist regime, the government added a large red star to the central steeple at the dome of the building, but after its downfall, the star was removed from the steeple. Here’s the Parliament in all its glory as seen from the Fisherman’s Bastion (of that more later) across the mighty Danube.